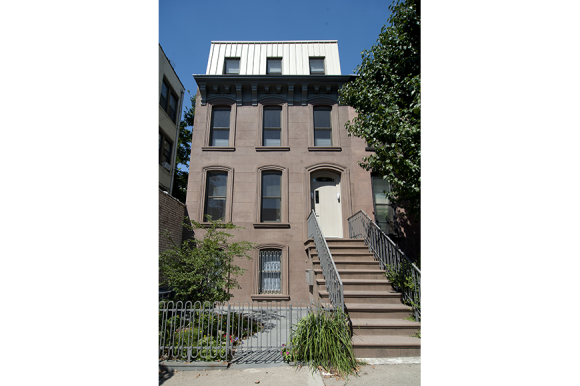 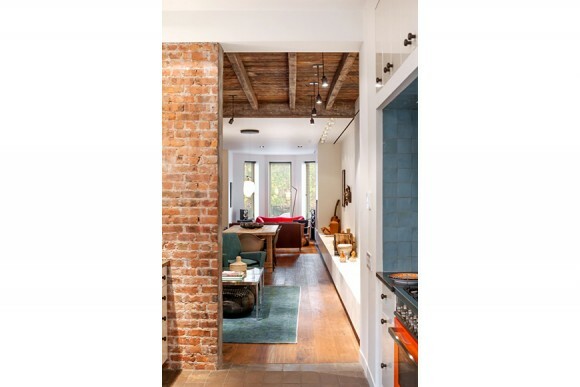 This gut renovation project transformed an existing structure back to its original roots as a 2 story carriage house. 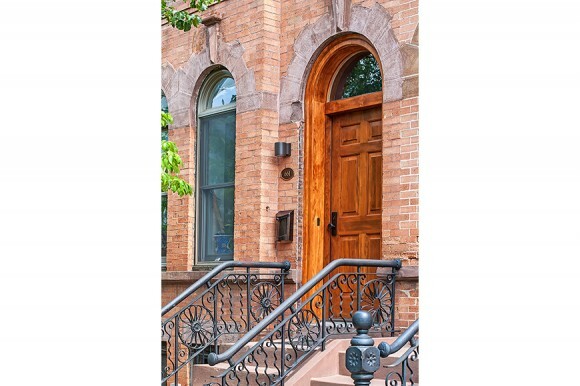 The work to the front facade was intended to maintained its Landmark presence. 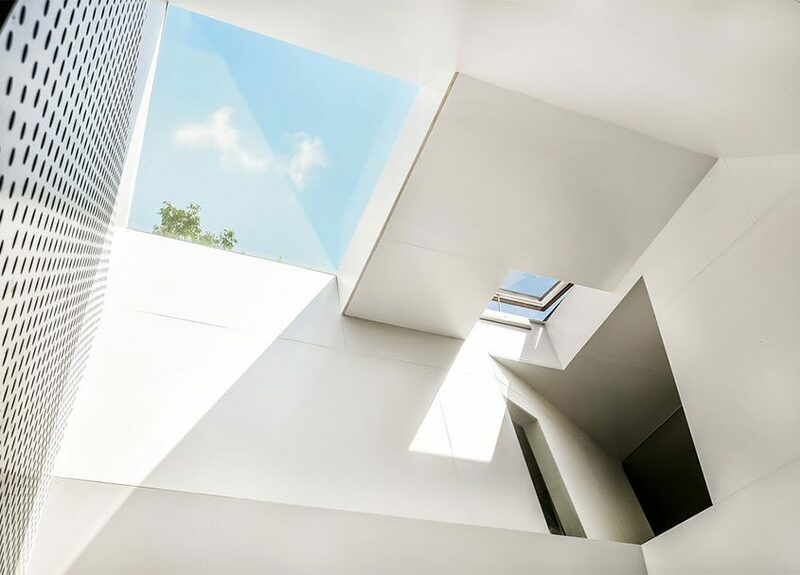 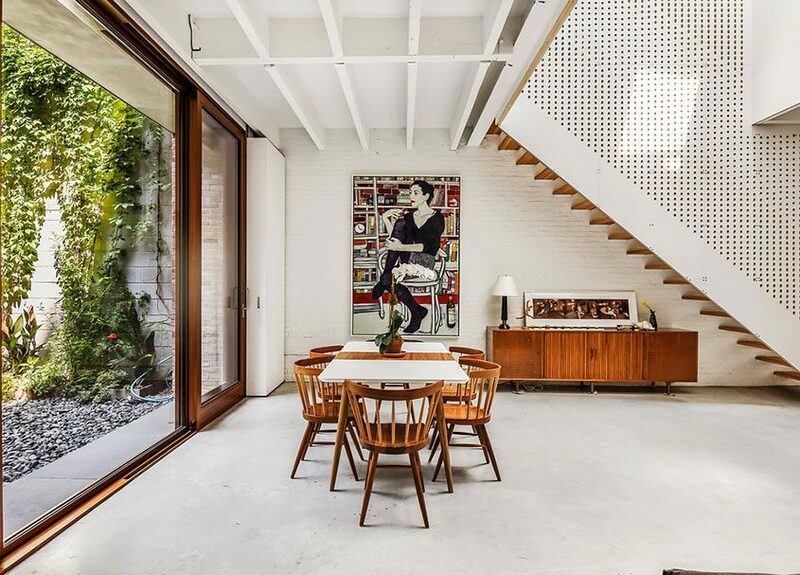 But upon entry, the space opens up to a modern open plan that centers around a courtyard carved away from the original 100 foot long structure. 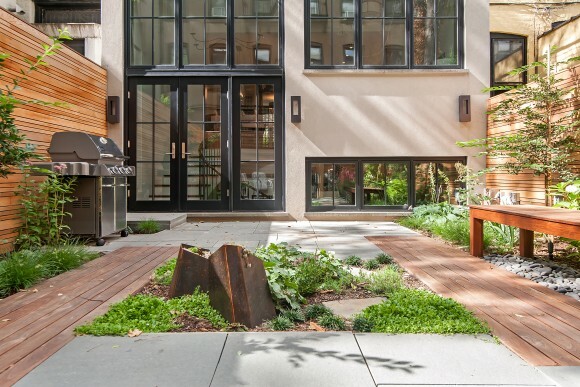 The installation of an enormous glass door system at this courtyard allowed for light to spill into a large portion of the ground floor. 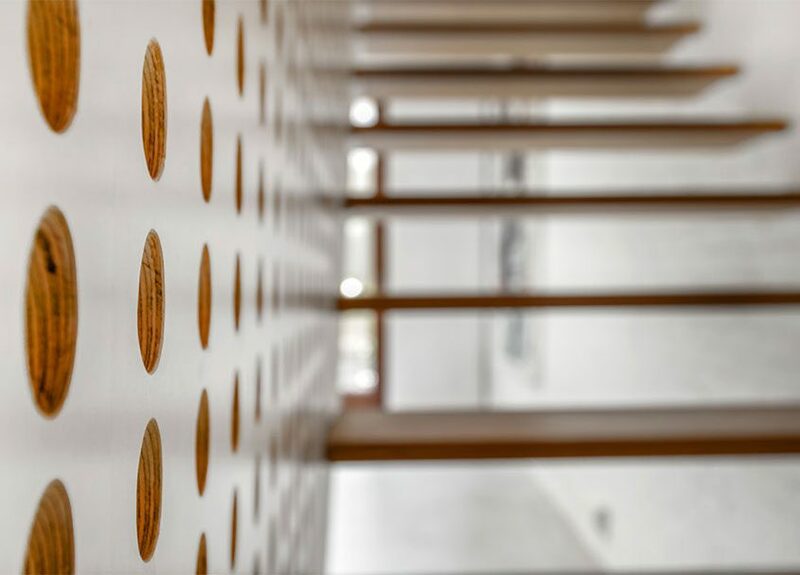 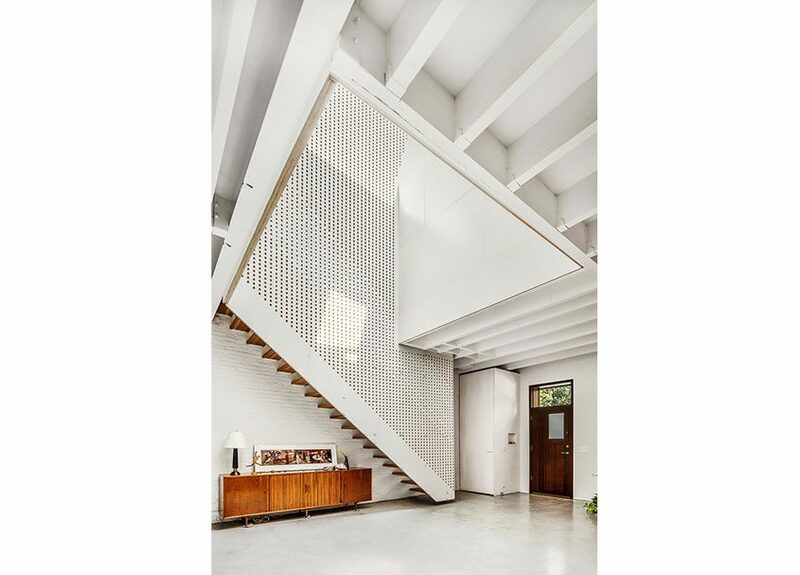 Other key features of this build include: polished concrete heated floors, CNC perforated panels at main floating stair, and a large atrium oculus out of custom wood paneling. 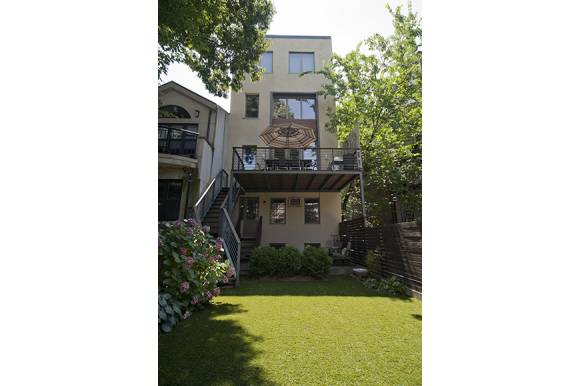 This design/build project includes a 25 foot rear addition and 4th story addition to double the size of this small brick house. 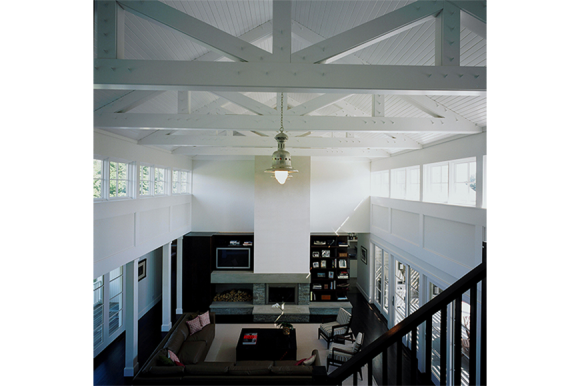 The entire house was restructured from the ground up. 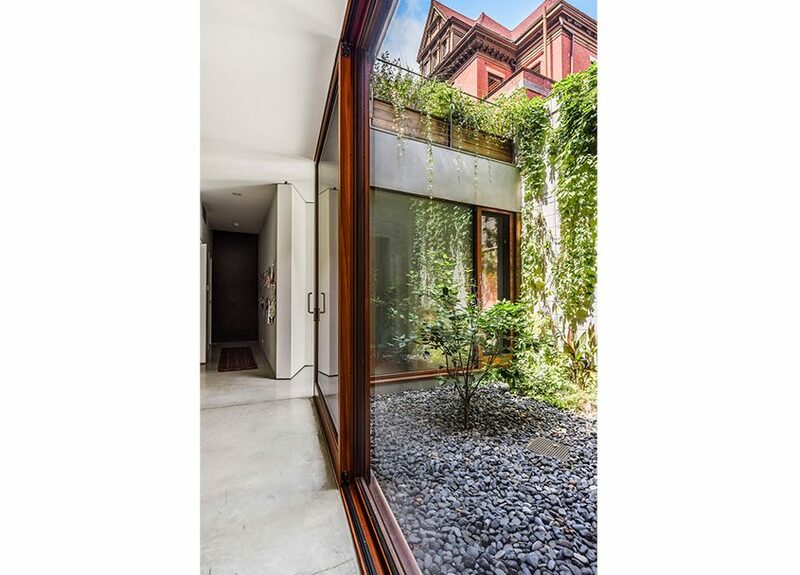 The rear façade has a modern open feel while the new front façade integrates with the fabric of the Park Slope neighborhood. 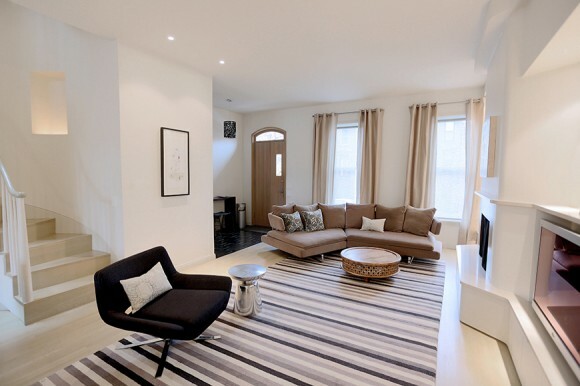 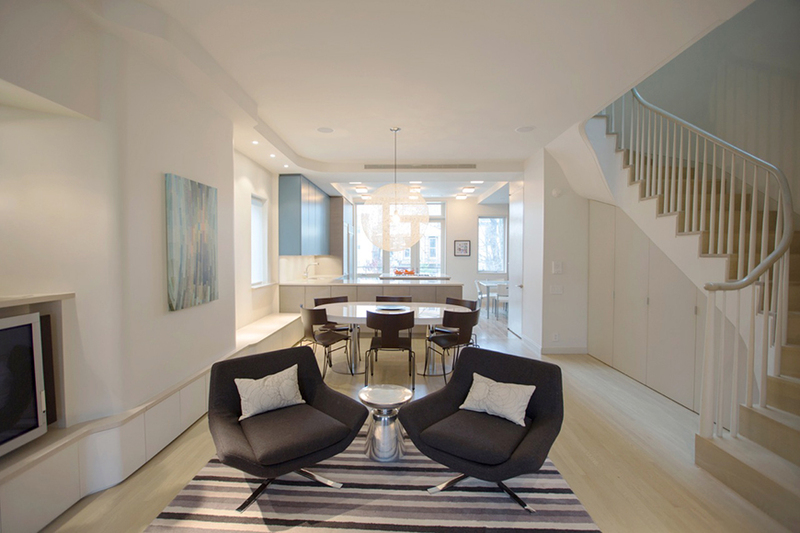 Inside gracious townhouse living is combined with intelligent modern design. 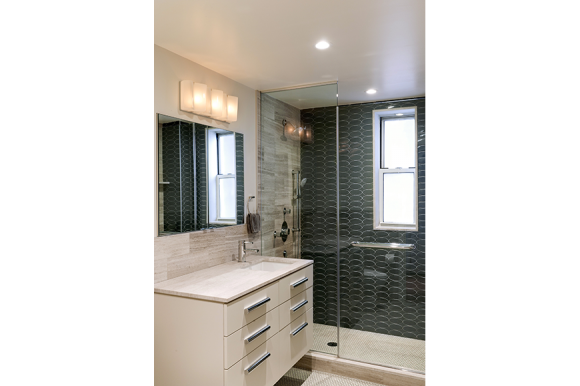 This design/build project was renovated in 2 phases. 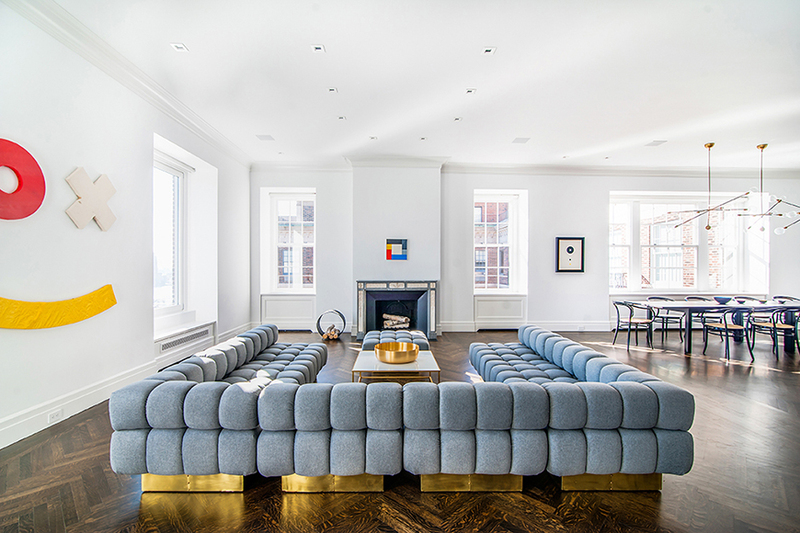 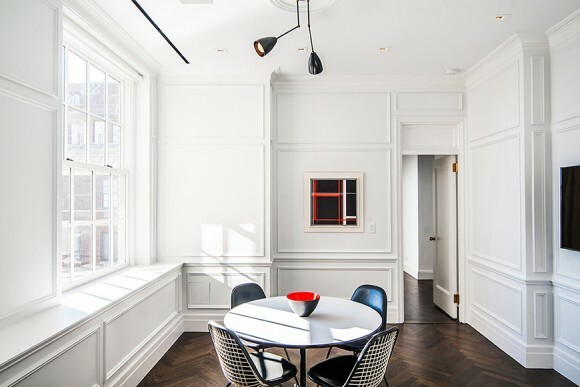 The 3,800 SF apartment was transformed from estate condition to an open, sun-filled apartment. 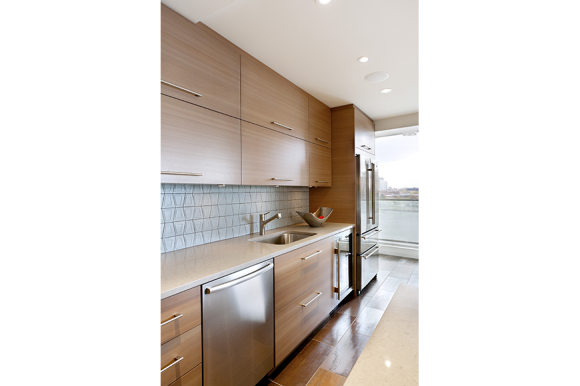 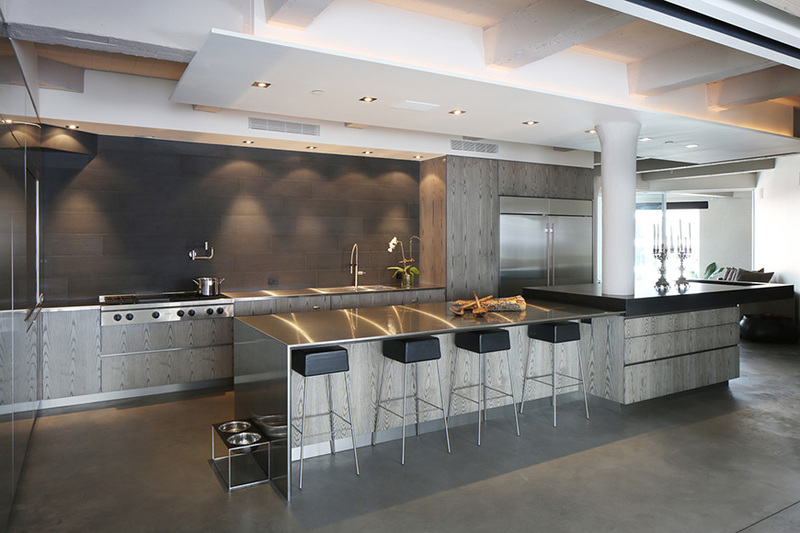 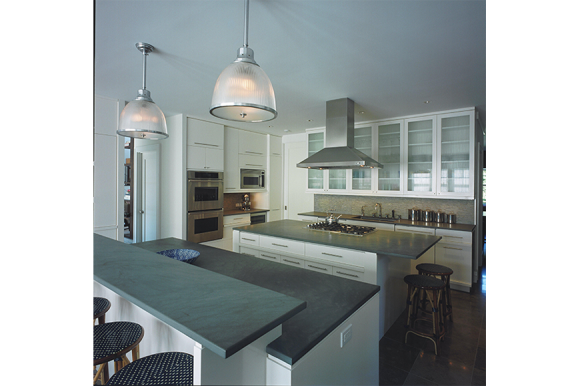 The kitchen was relocated to create a relationship to the main living space and the East River views. 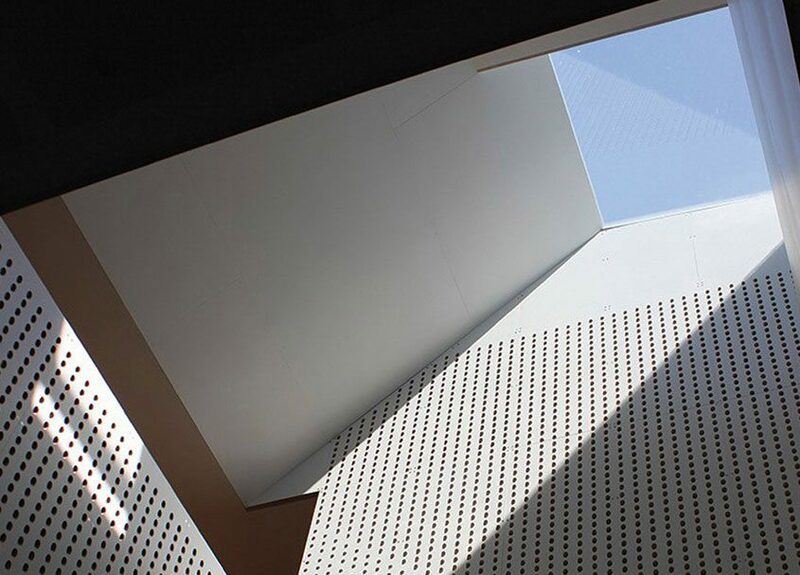 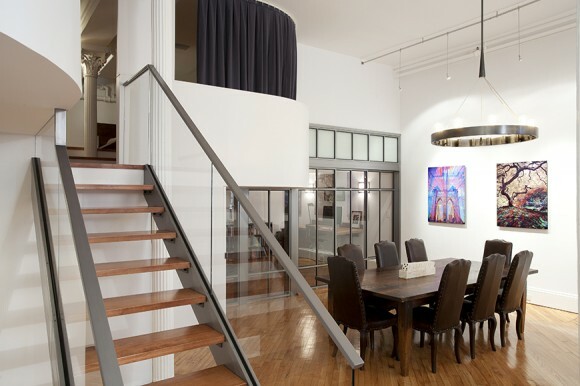 This 4-story townhouse is an exploration in materiality and detailing. 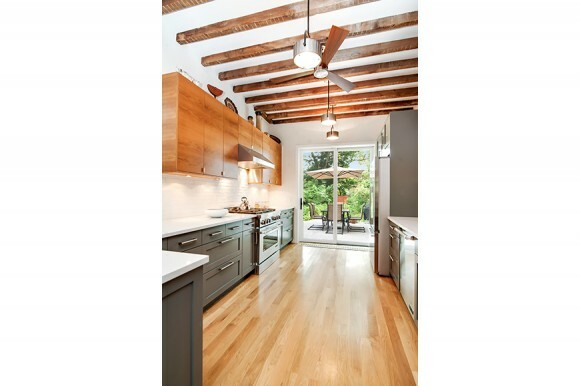 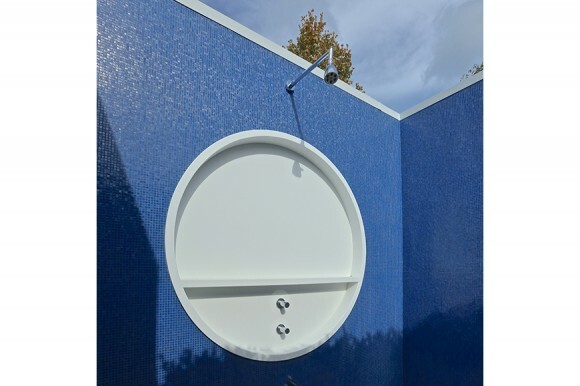 As the builders for this project it was our job to bring together wood, steel, brick, concrete, plaster and hand-crafted tile in a seamless way. 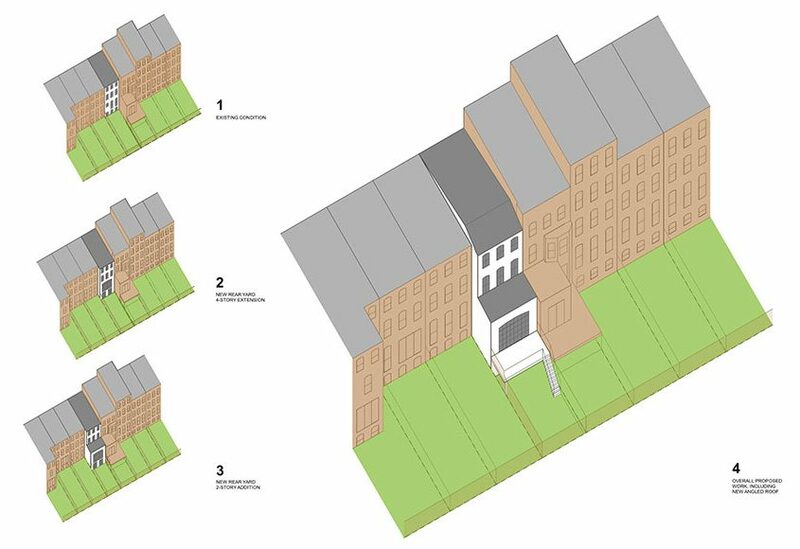 The result is a 5 bedroom house built for modern living. 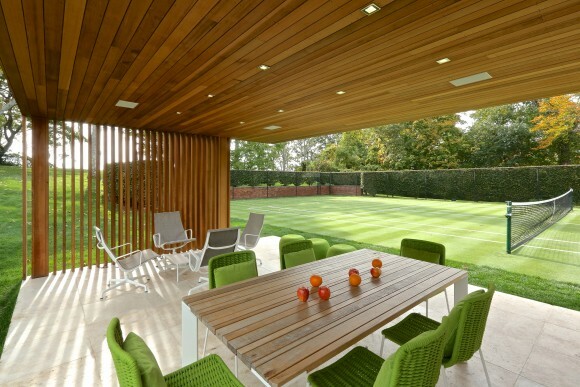 New custom designed tennis pavilion, pool pavilion and pool and patio renovation modernize the exterior of this home. 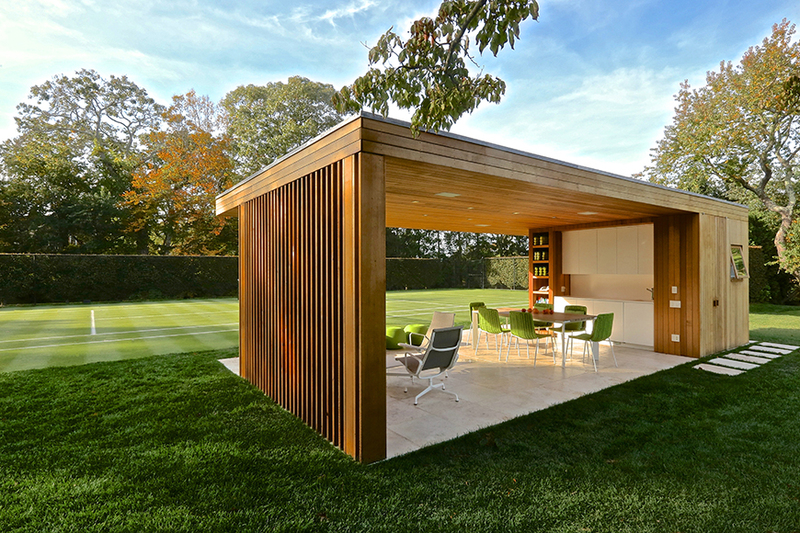 The new structures although situated at different locations on the property, create serene places for leisure while framing the landscape beyond. 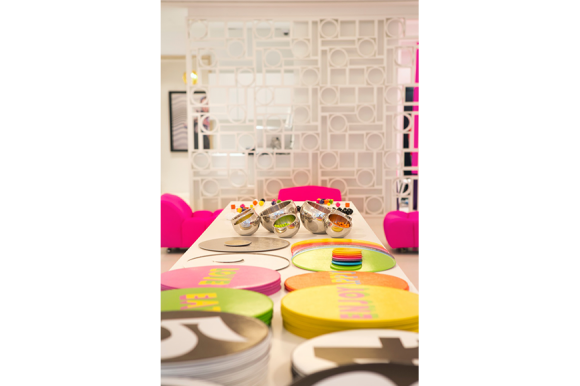 This flagship store was inspired by the cool, mod designs by Lisa Perry. 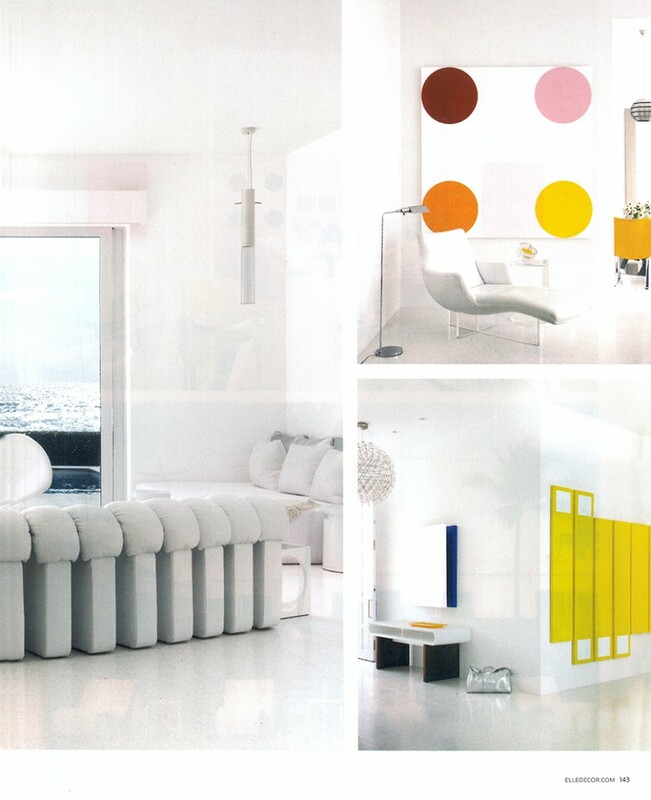 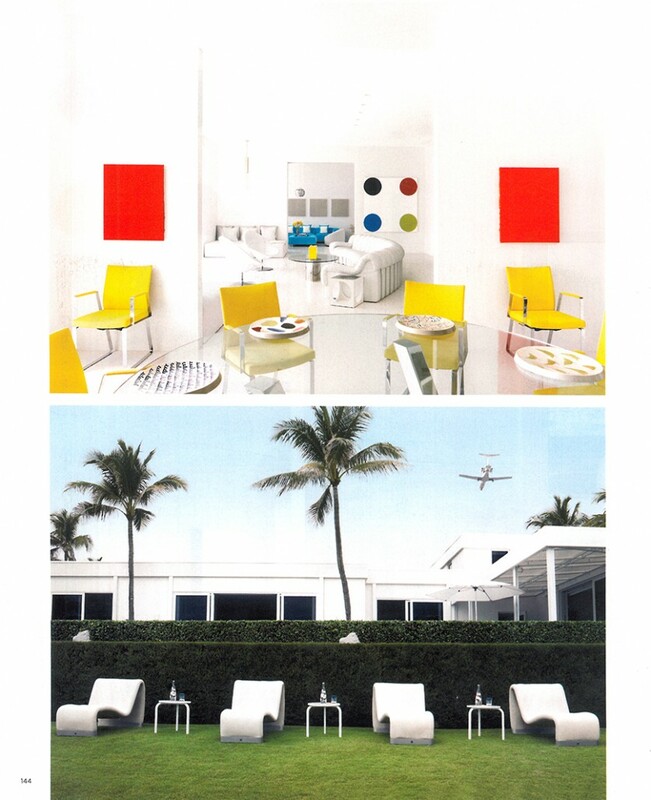 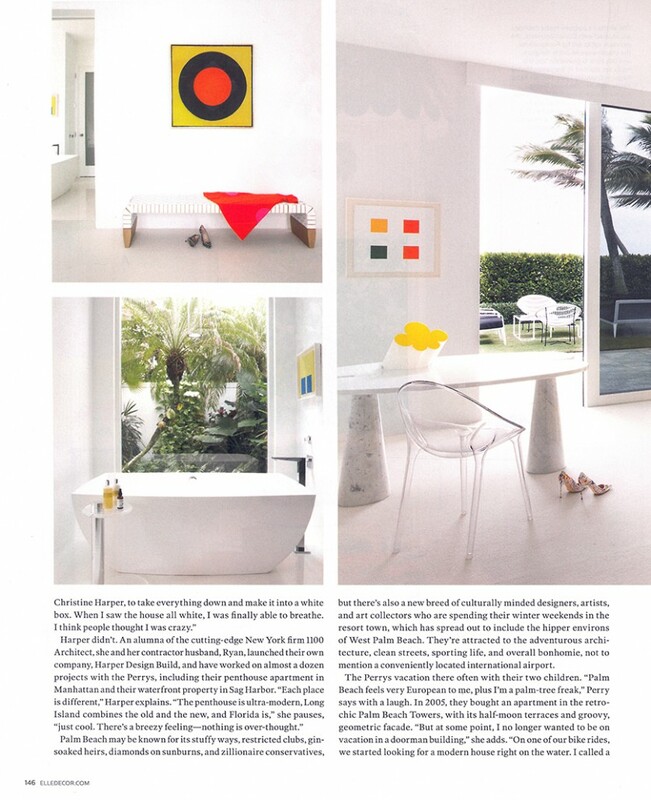 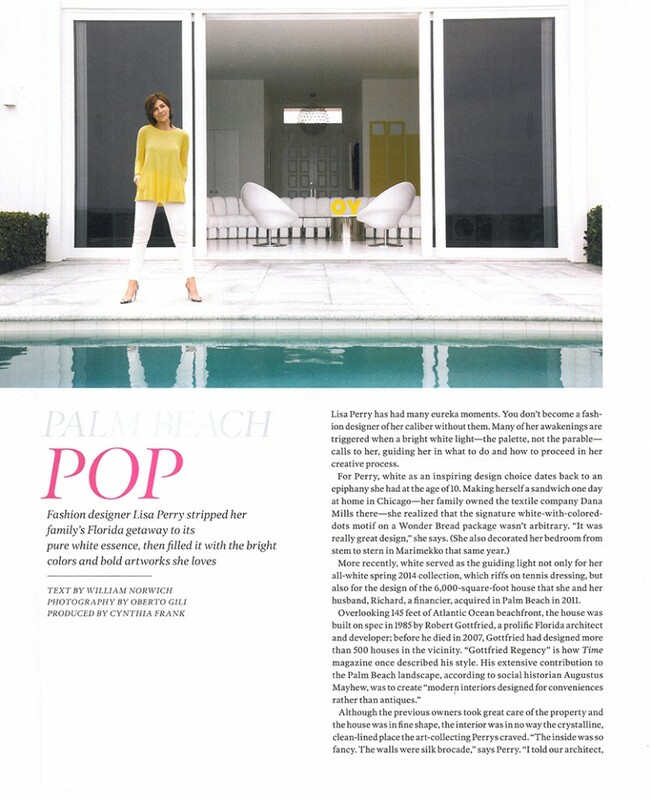 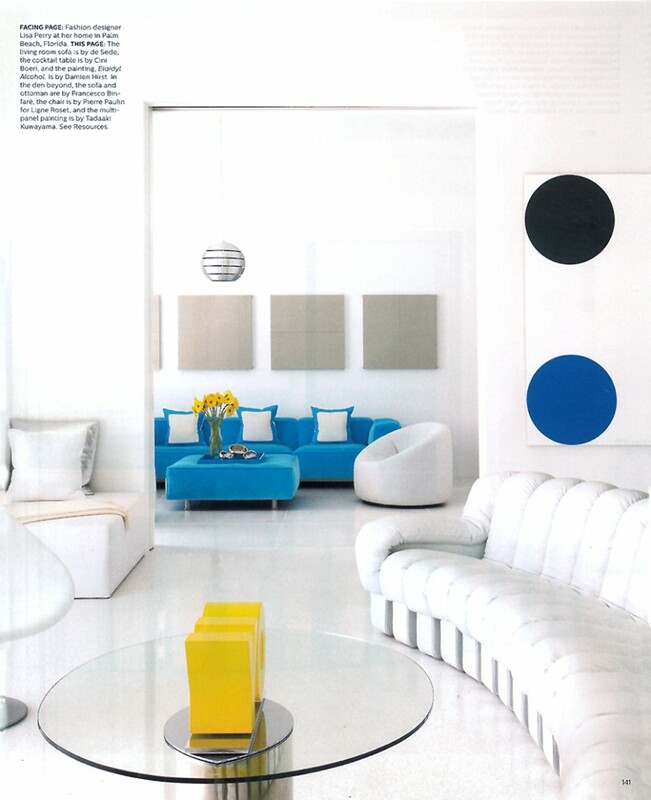 Bold shapes, recessed lighting and sleek white surfaces create a canvas to display the Lisa Perry collection. 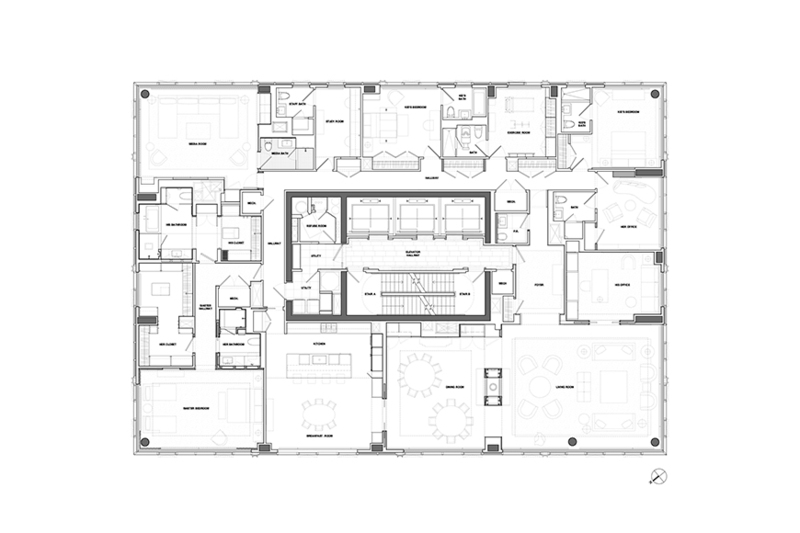 This project also included the design for 2,000 SF of office and design studios. 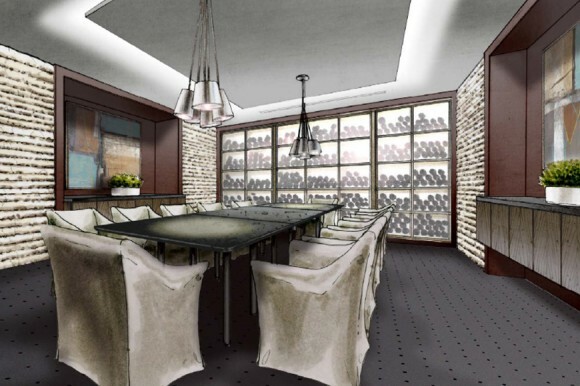 The creation of 2 conference rooms and a multi-media/dining room complete this series of projects by connecting these new spaces to the public hallways and wine cellar previously completed. 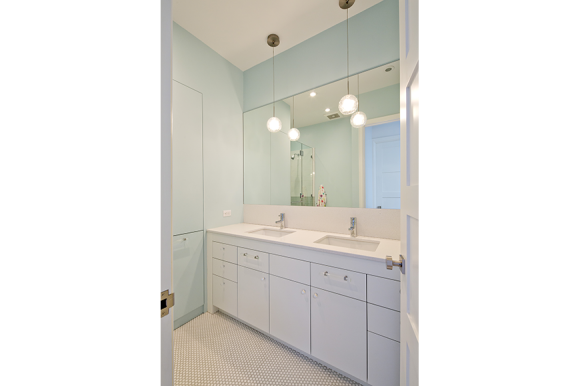 Challenges involve retaining a sense of elegance in multi-function rooms that are constantly being repurposed and re-organized. 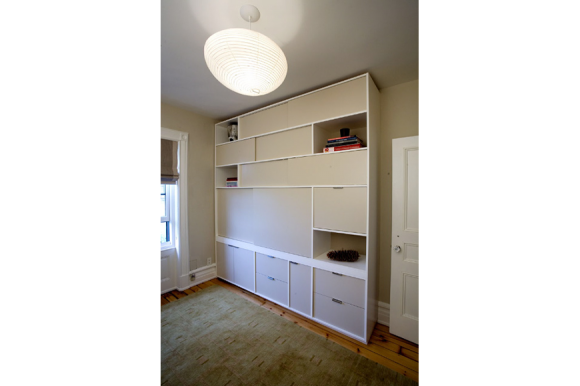 Flexible furniture selection and planning make this possible. 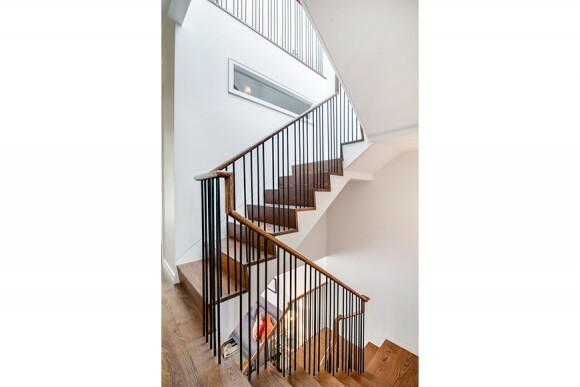 This 2 story design/build project is a jewel of a house. 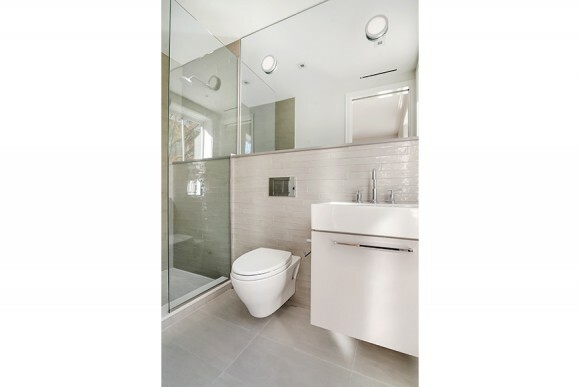 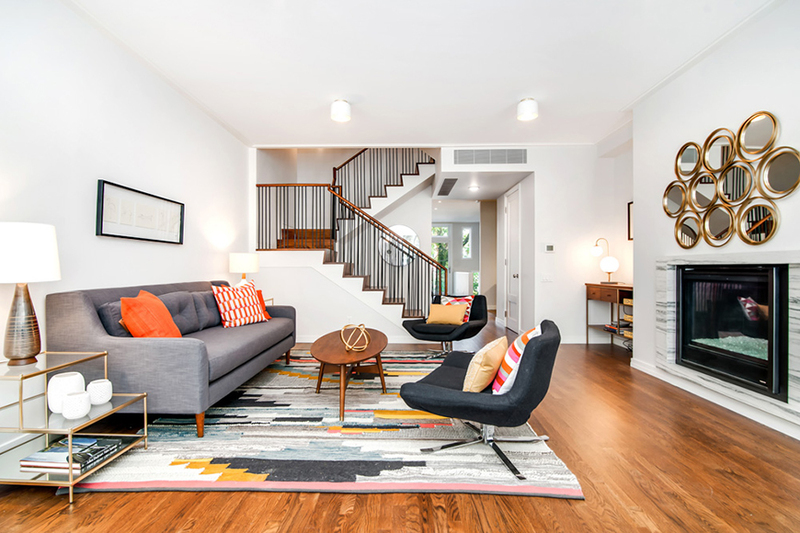 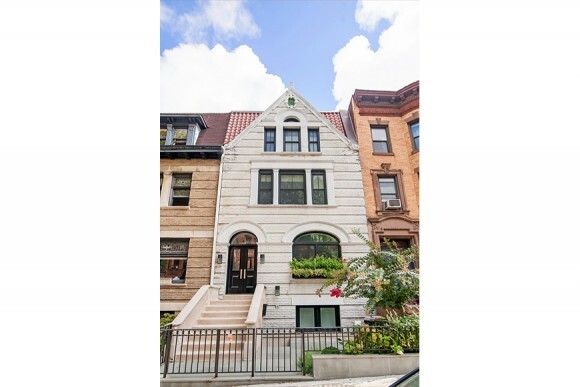 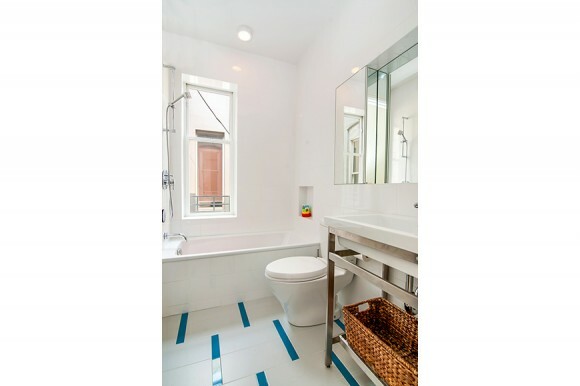 The gut renovation resulted in a 3 bedroom, 2 bathroom house w/an open parlor floor plan for modern living. 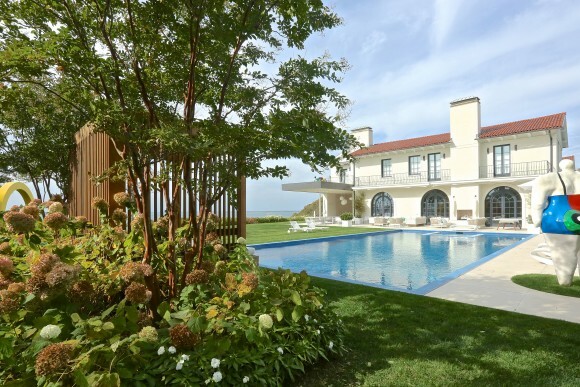 A large double door at the rear of the house connects the interior to the exterior of this unique 150 ft deep property. 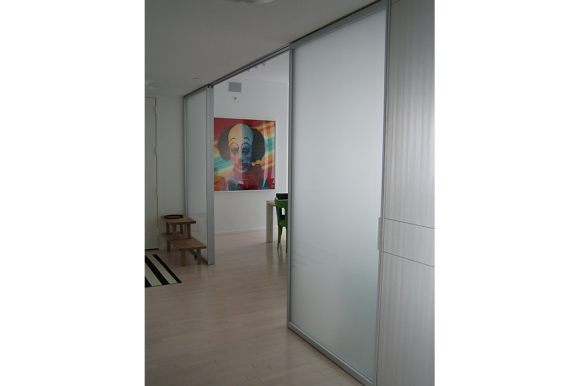 This 6,000 SF house overlooking the Atlantic Ocean beachfront was transformed into a white box for the client’s minimal art collection. 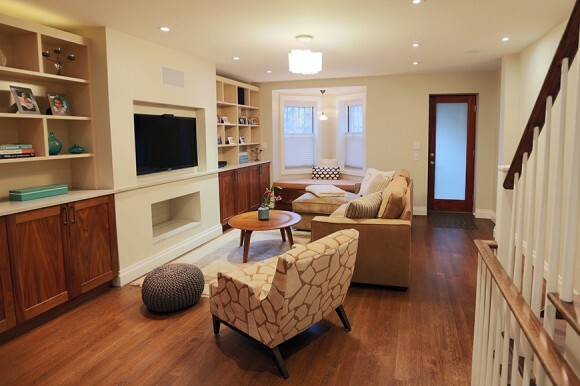 The house has an upscale yet casual feel. 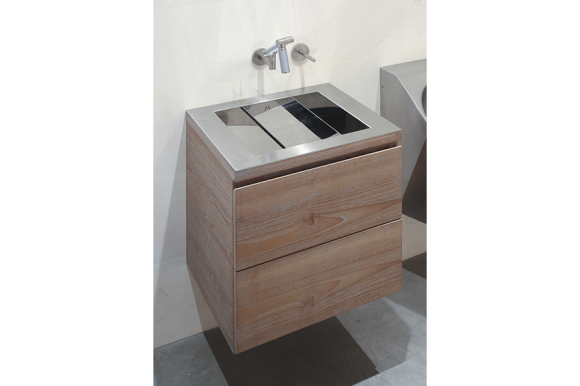 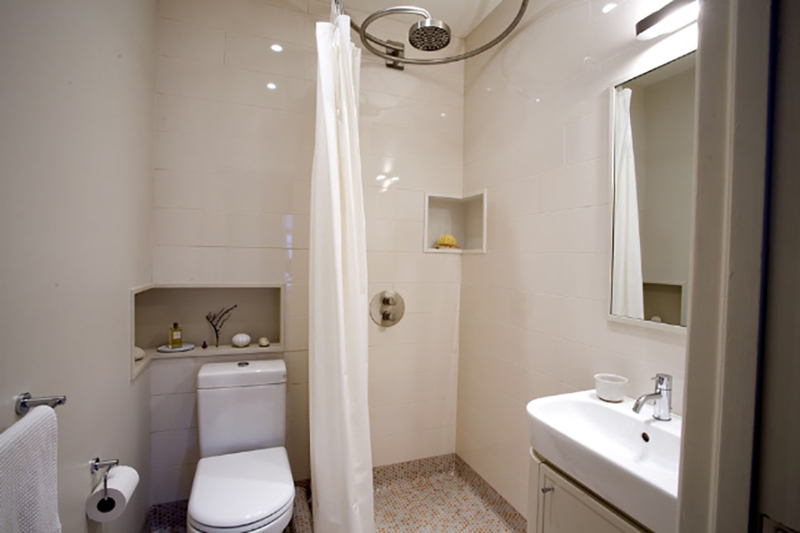 The bathroom and kitchen designs are simple yet elegant. 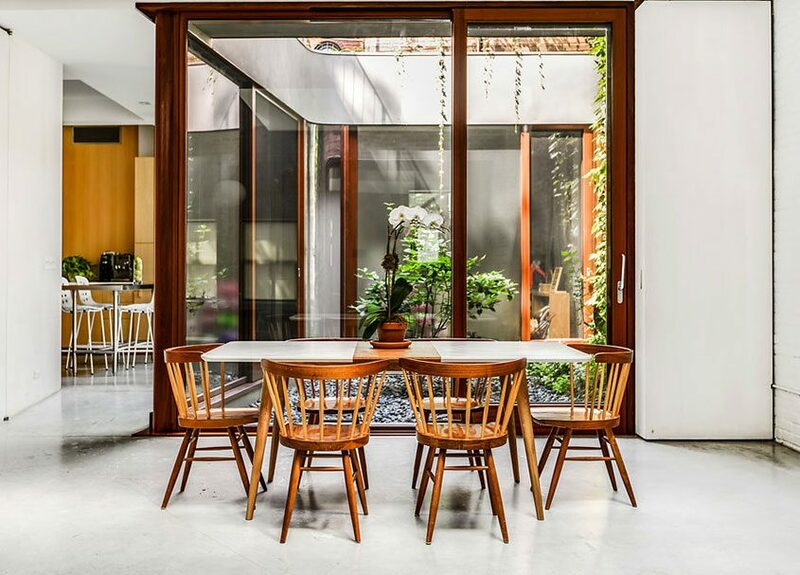 Large sliding doors open the interior space to the outdoors connecting the house to the ocean. 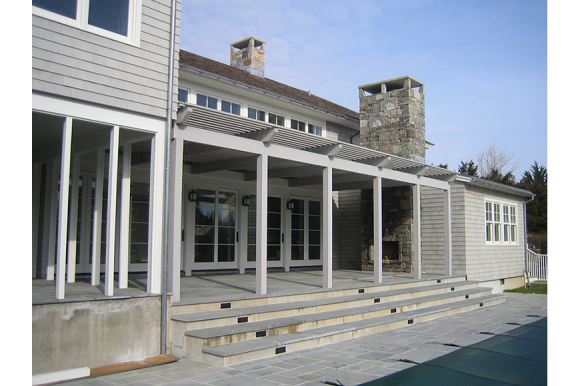 This custom built home is located on the Atlantic Ocean in historic Cape Cod. 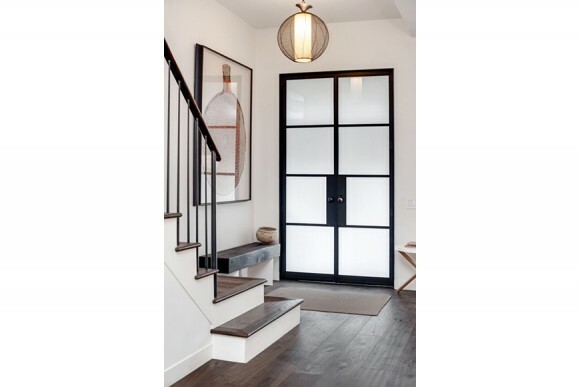 The design of this home takes advantage of the breathtaking views by opening up the living spaces to the ocean side view using large glass and steel doors and windows. 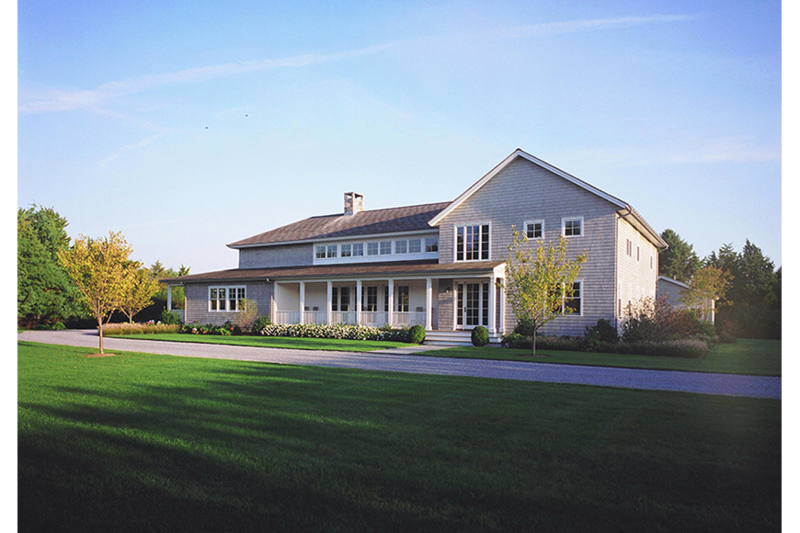 This distilled shingle style home merges modern living concepts with a traditional style. 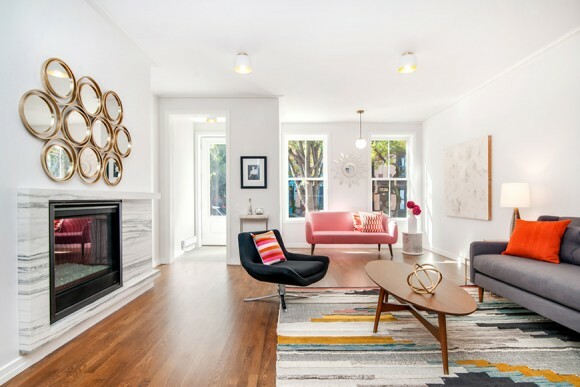 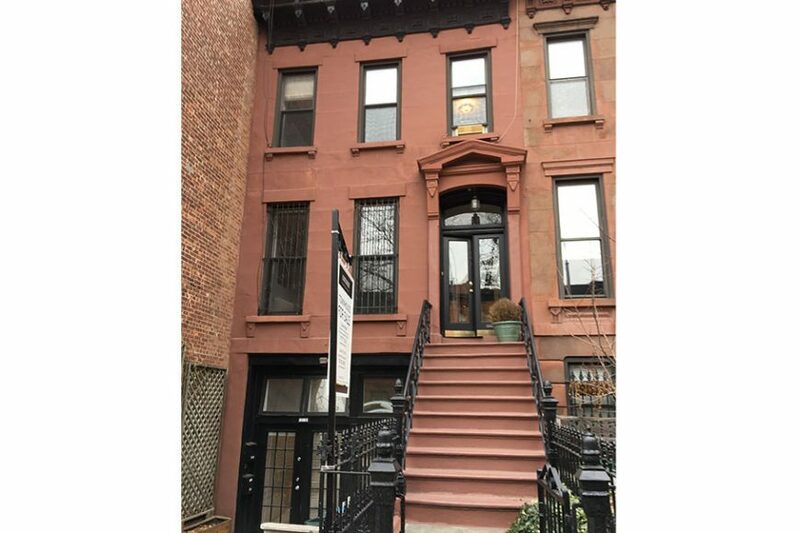 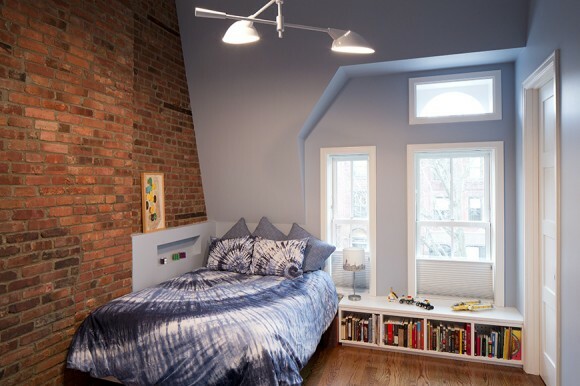 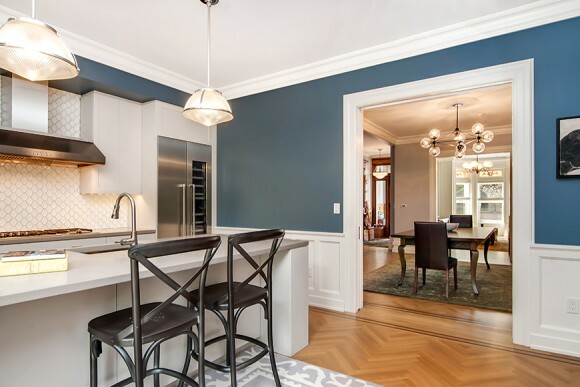 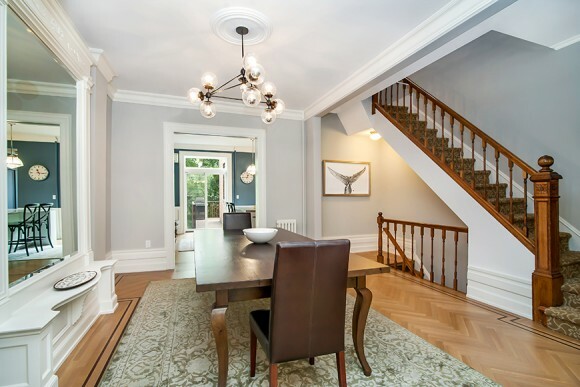 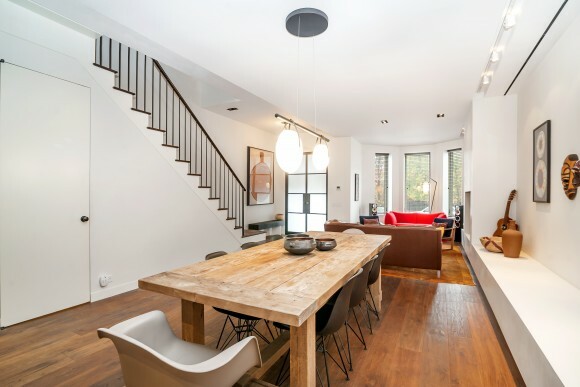 This design project in the heart of Park Slope created 1,200 SF of new living space including a family room, guest/office suite, bathroom and playroom. 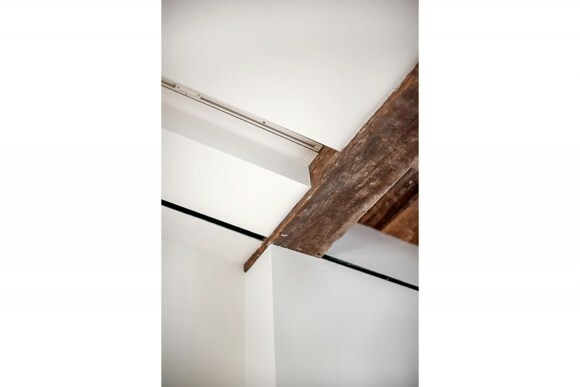 The building was underpinned 3’ deep to allow for tall ceiling heights in the Cellar level. 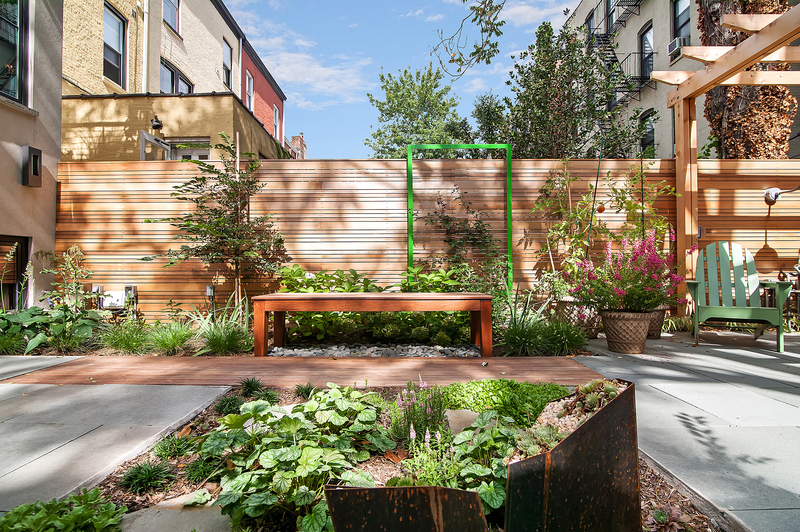 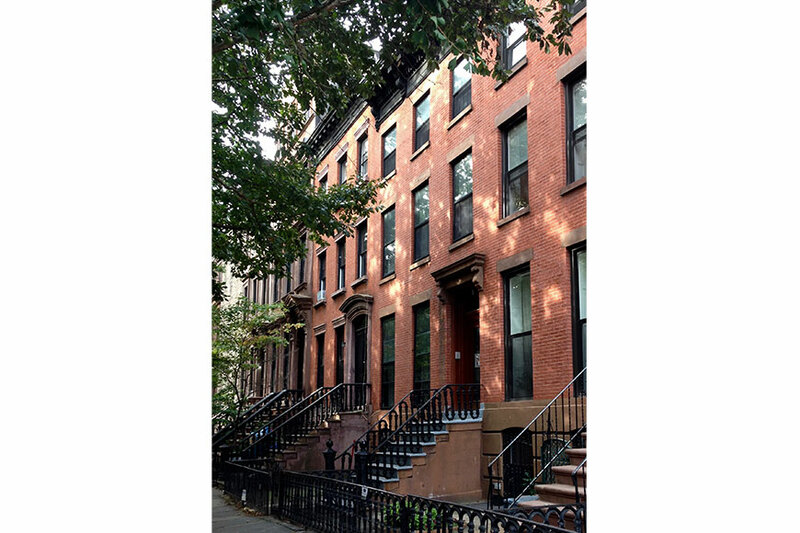 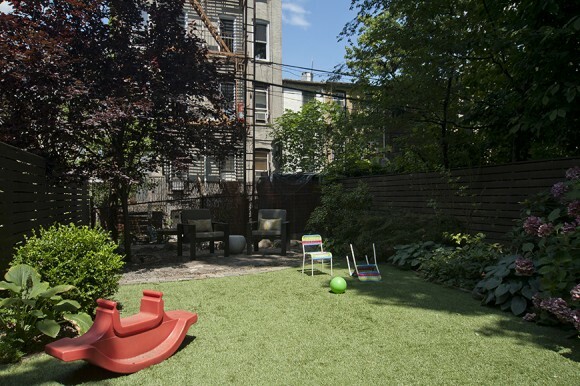 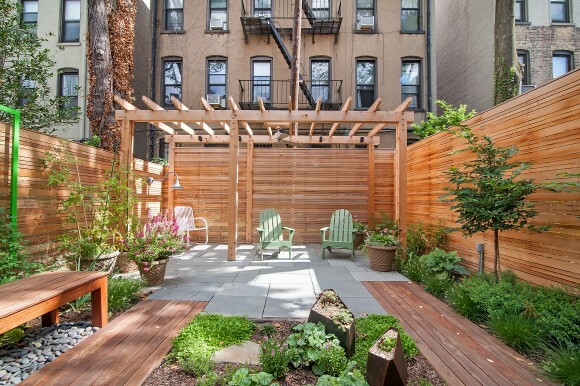 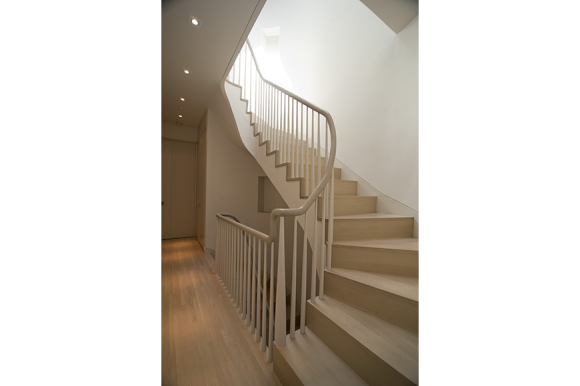 This build project in the West Village was a transformation of the garden level of this townhouse. 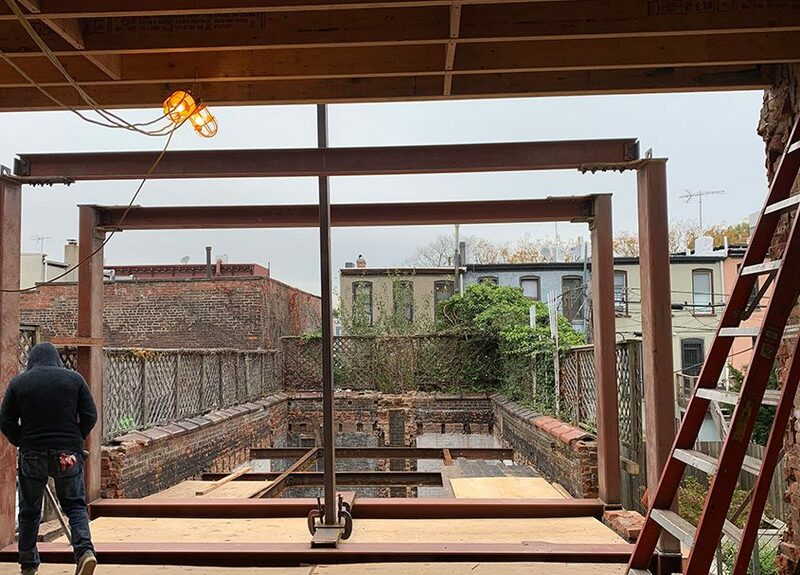 Major structural work was required to open up the rear façade of the garden level by using floor to ceiling custom steel and glass doors. 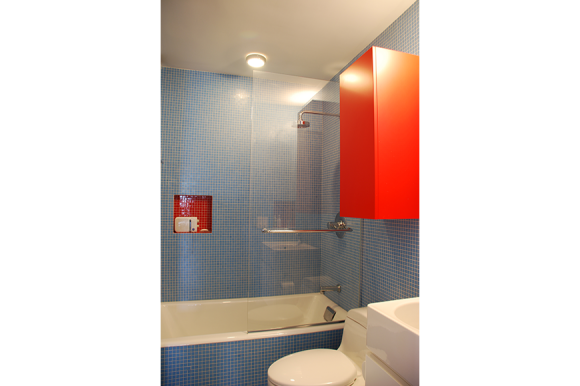 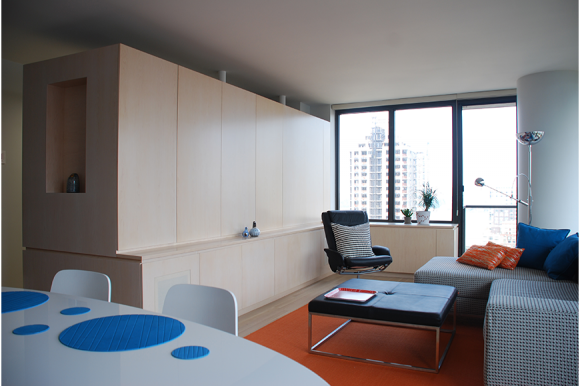 This renovation resulted in a small apartment including kitchen, bathroom, bedroom and living space. 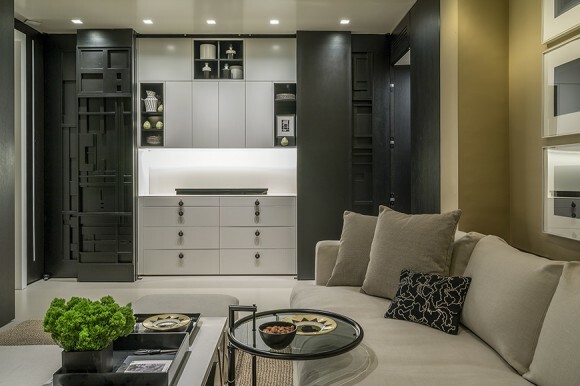 Designed for an interior designer no detail was left to chance. 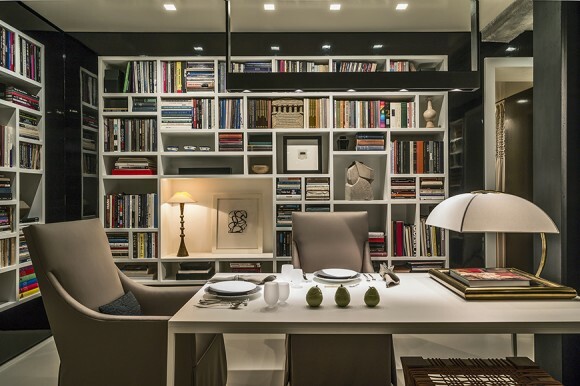 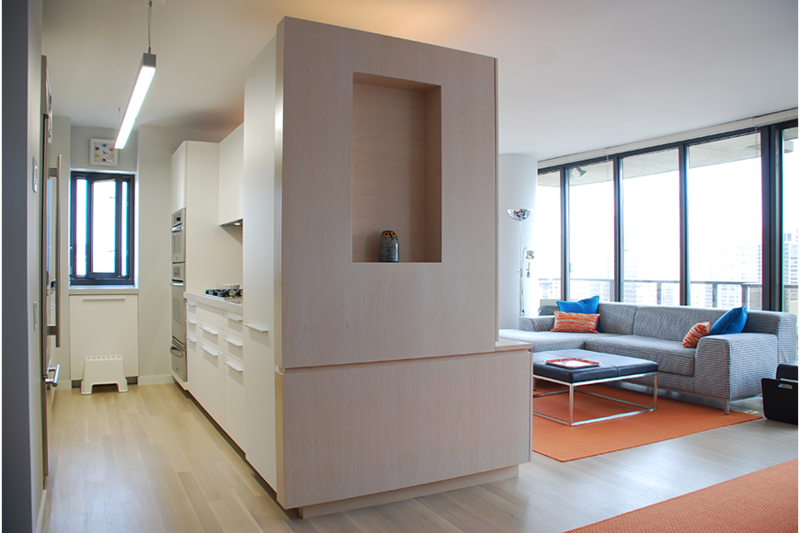 This 2,000 SF apartment w/park views brings contrasting materials together in a cohesive way. 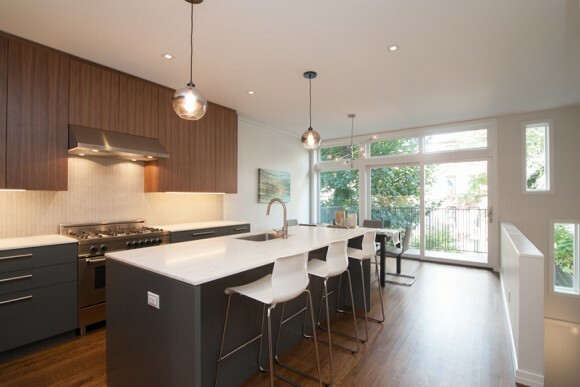 Features include a seamless epoxy resin floor, stainless steel kitchen, and custom corian cabinetry throughout. 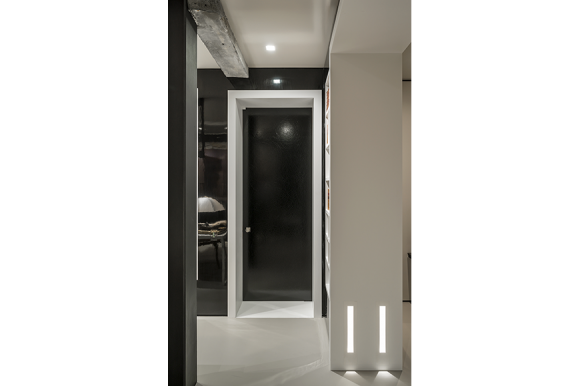 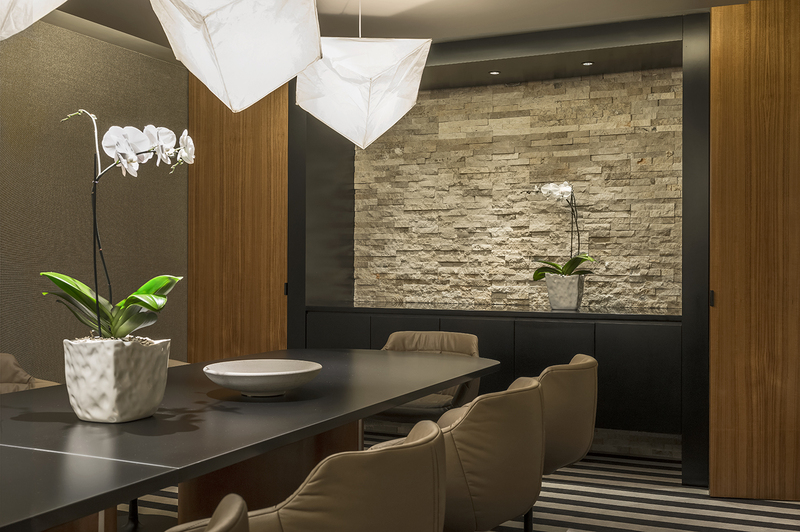 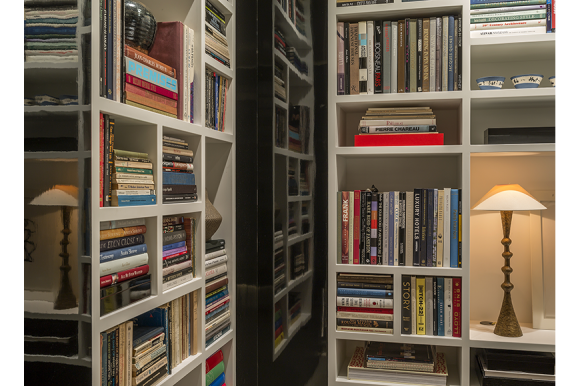 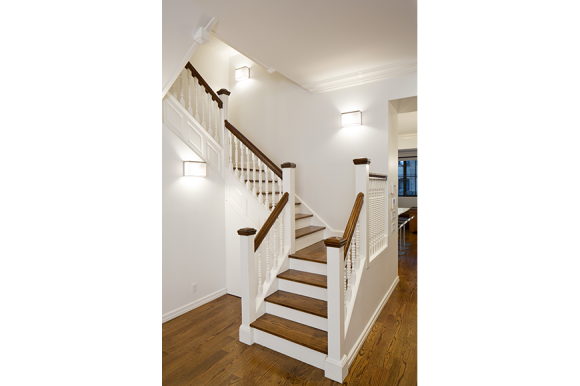 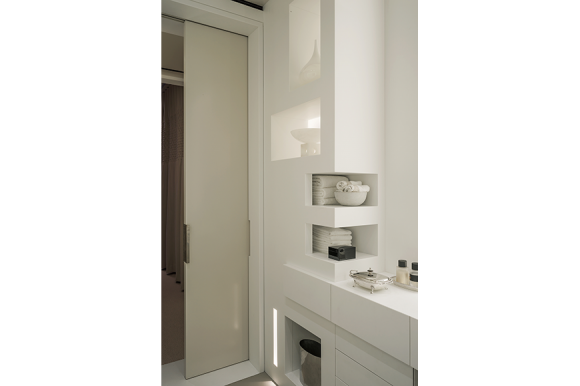 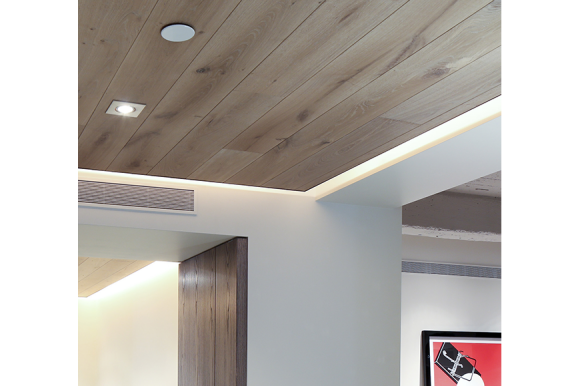 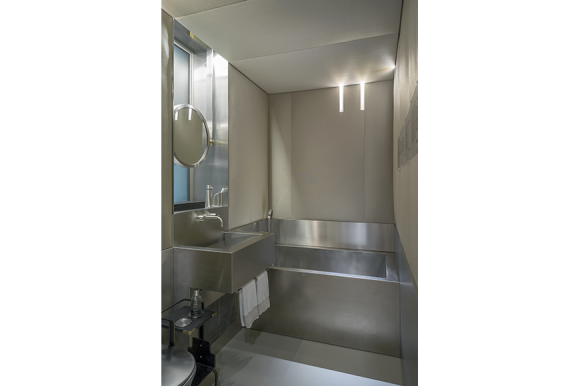 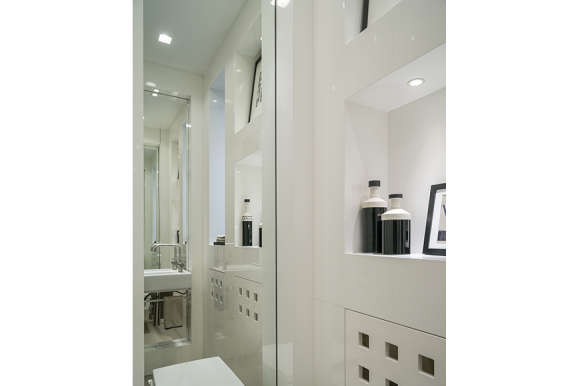 Thoughtful lighting strategies were incorporated using cutting edge LED fixtures placed in walls, ceilings and floors. 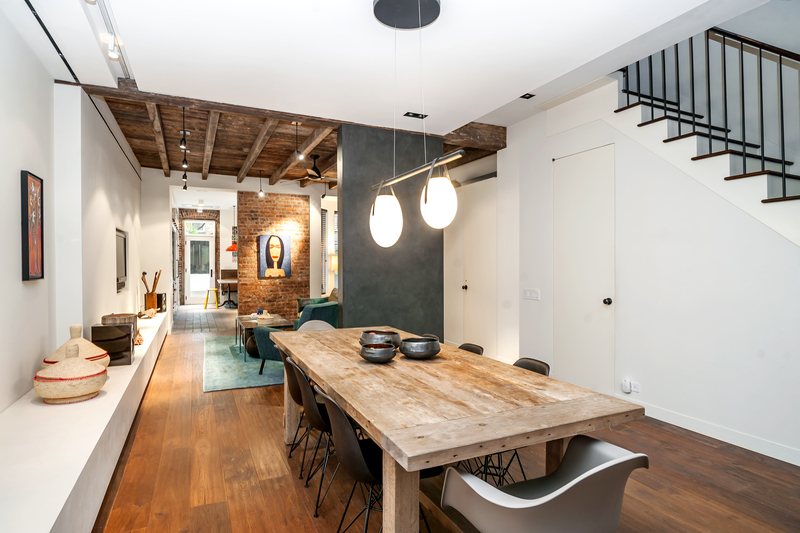 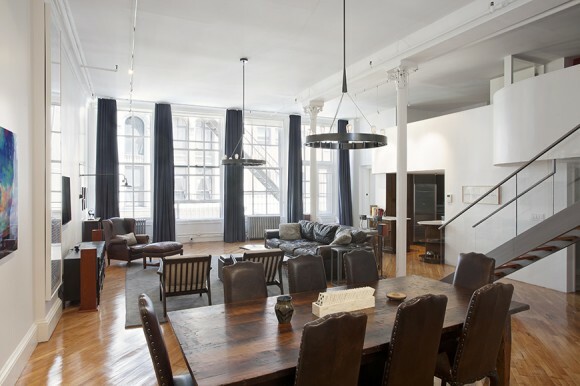 This 5,000 SF loft residence combined concrete floors, exposed brick walls, dark stained wood, and stainless steel details to create a home suitable for a bachelor. 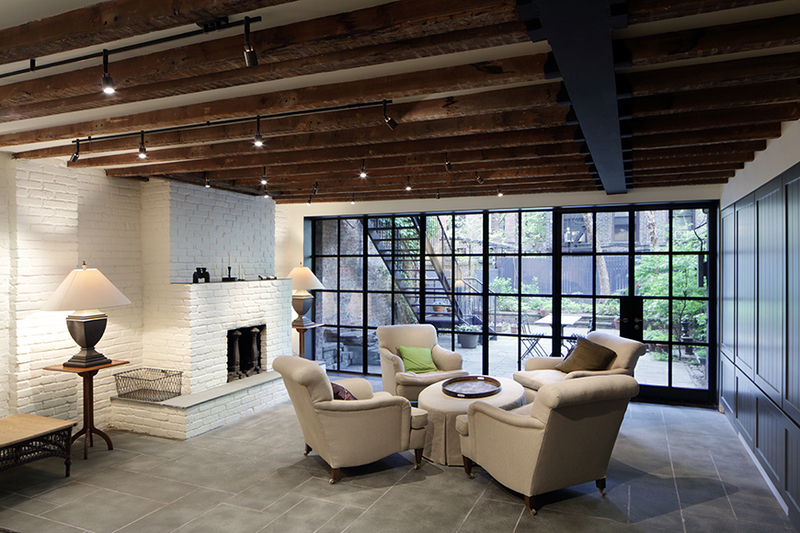 The raw materials in contrast with the open views to the Hudson River that flood the loft with light create a unique juxtaposition between interior and exterior. 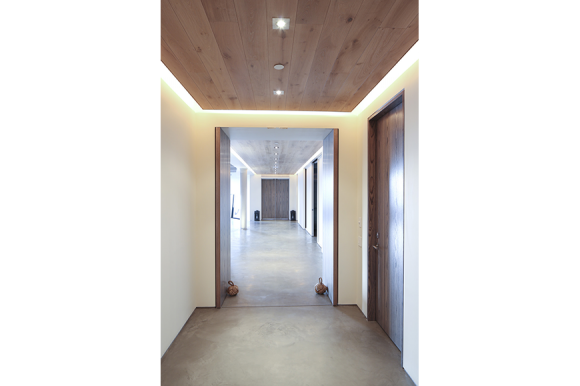 To update the lower level of this house, we created an underground “inn” consisting of 4 guest rooms and a dining/kitchen area. 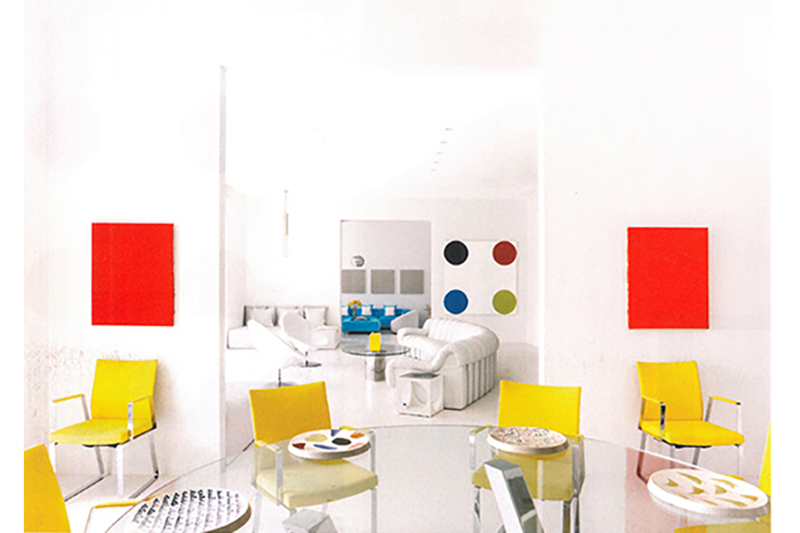 The client’s love for color, modern lines and shapes comes through in this happy space. 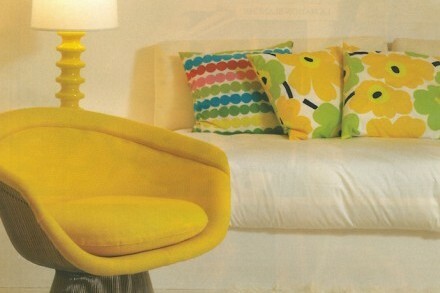 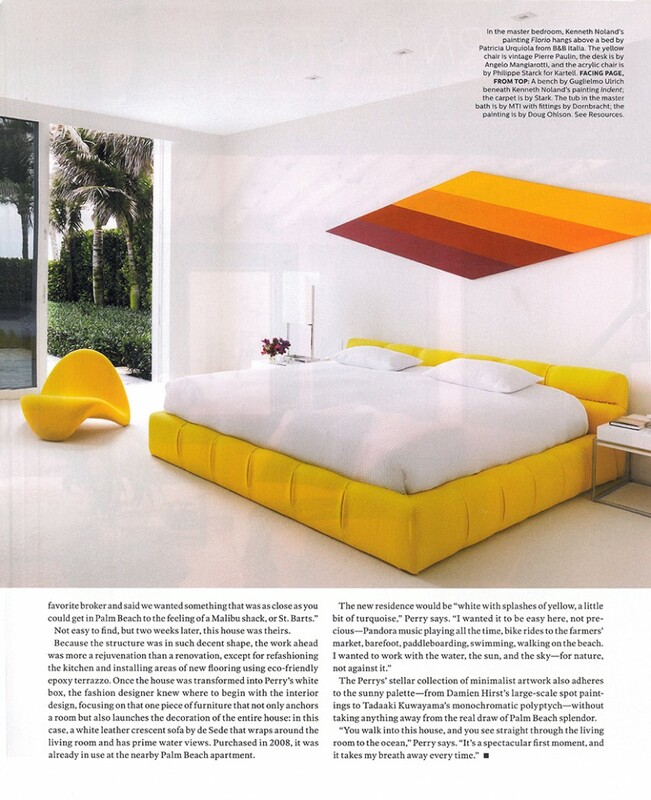 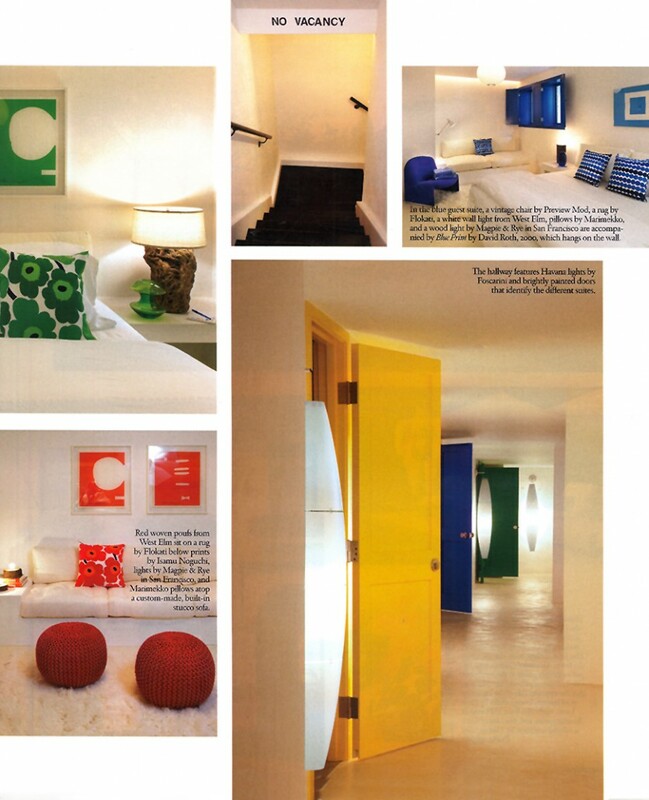 With custom built-in beds and sofas the client was able to move in by adding a chair and color to each suite. 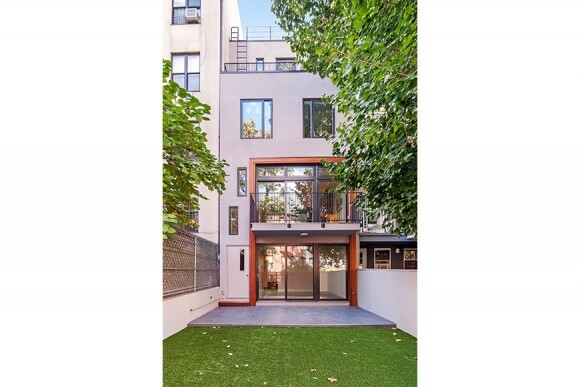 This recently completed design/build of a 3,800 SF residence was a complete gut renovation of 4 stories and included a 2 story addition with terrace. 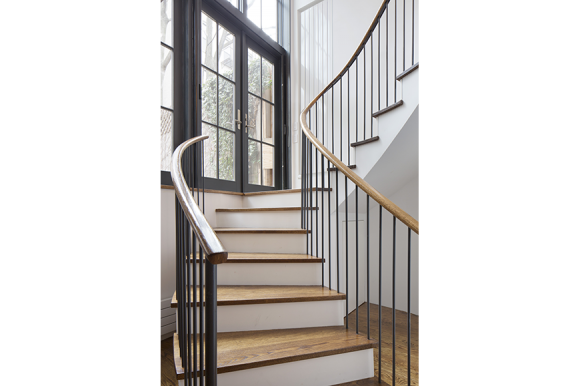 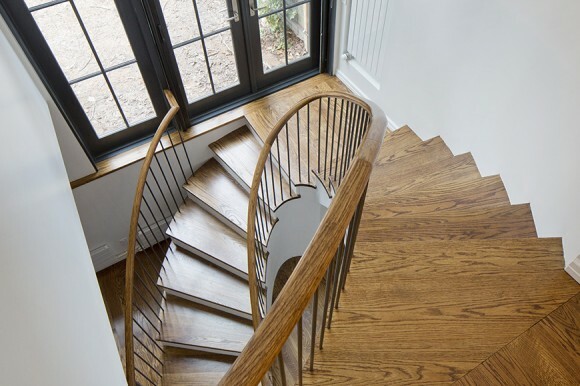 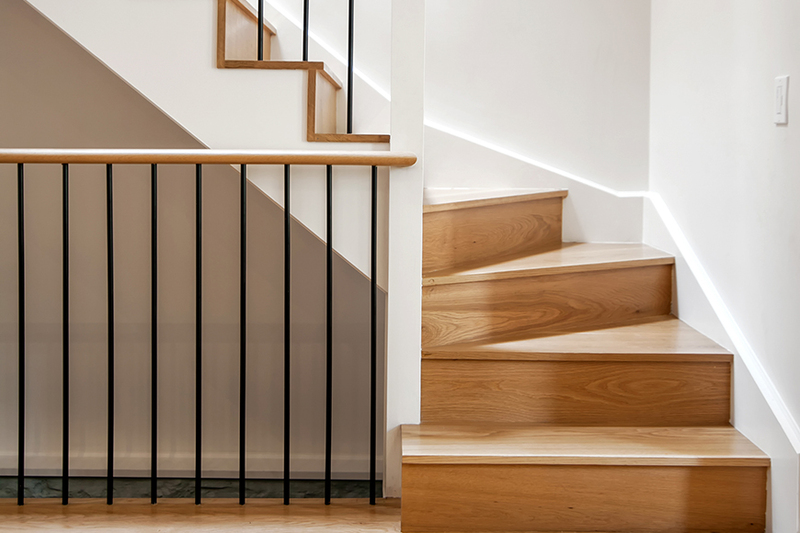 The house was converted from a 3-family to a single family residence and was designed around an existing re-furbished staircase. 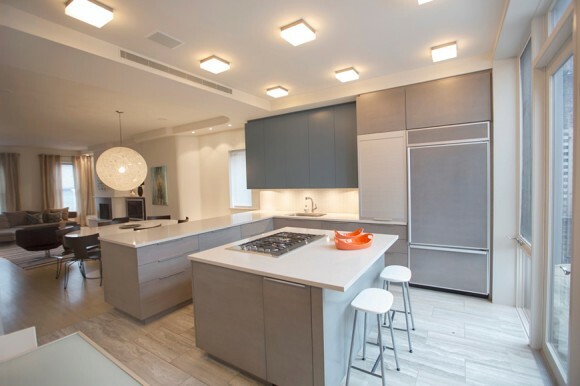 Features of the house include open views to the garden, double height gym, and a custom designed and built kitchen as the heart of the home. 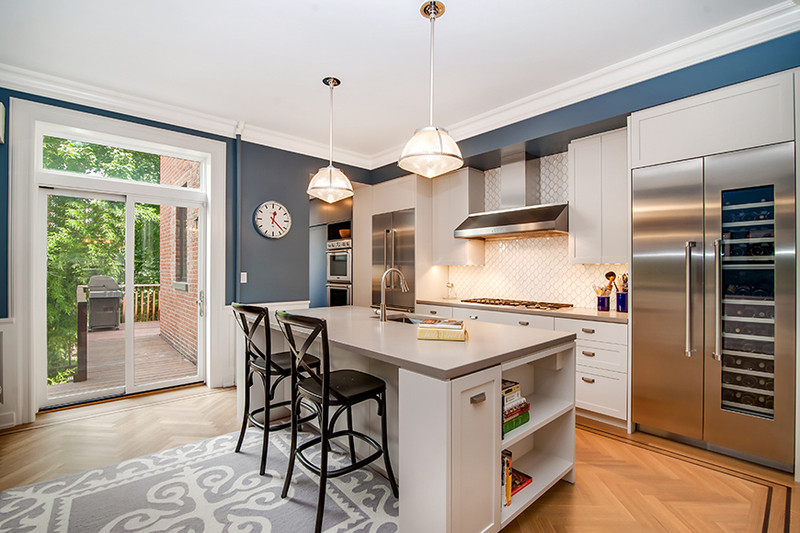 This design/build project incorporates historic details with a modern new kitchen, butlers pantry, and powder room. 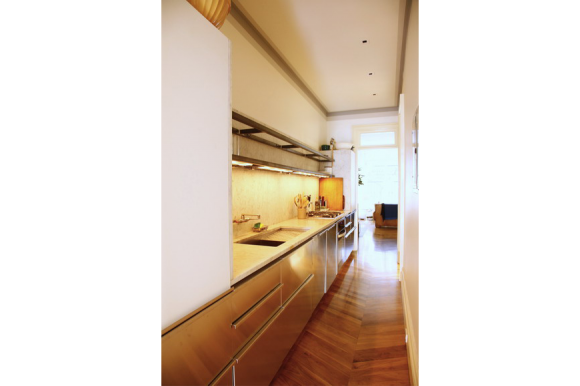 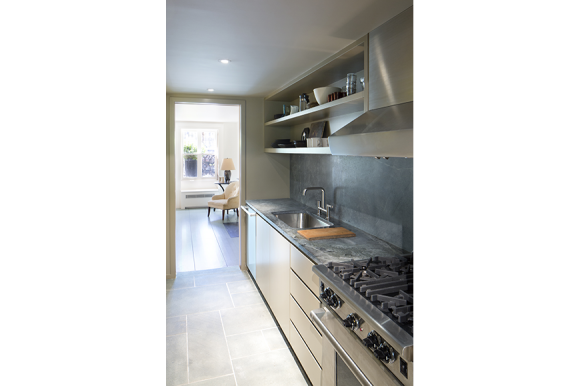 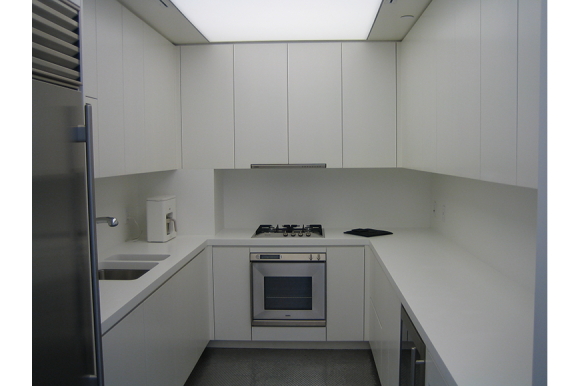 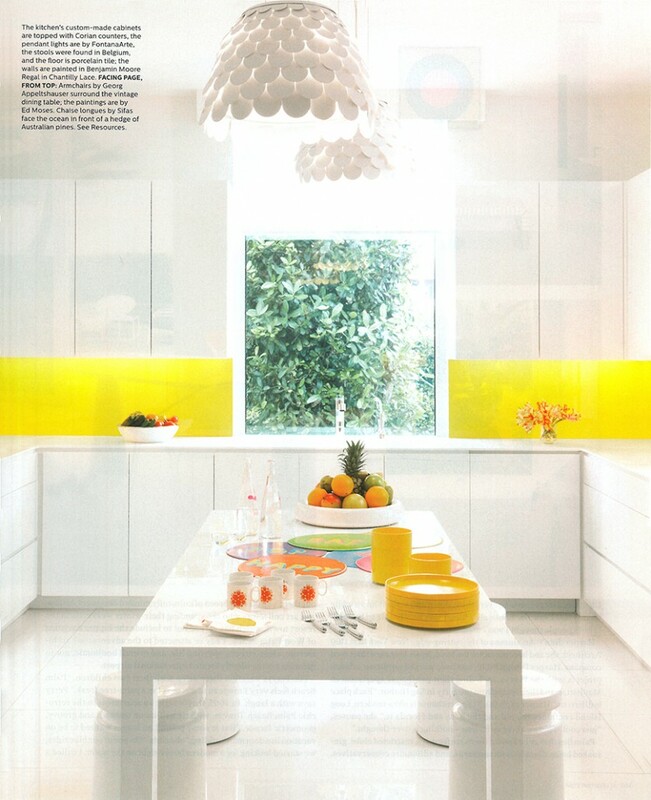 The focus of the project was to create a chefs kitchen within the framework of the existing details of the house. 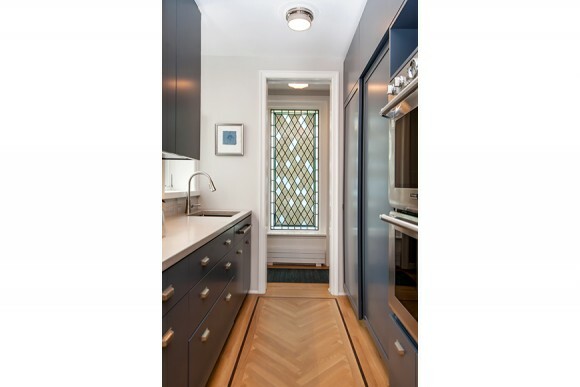 A special features of the project are concrete countertops and a stained glass window. 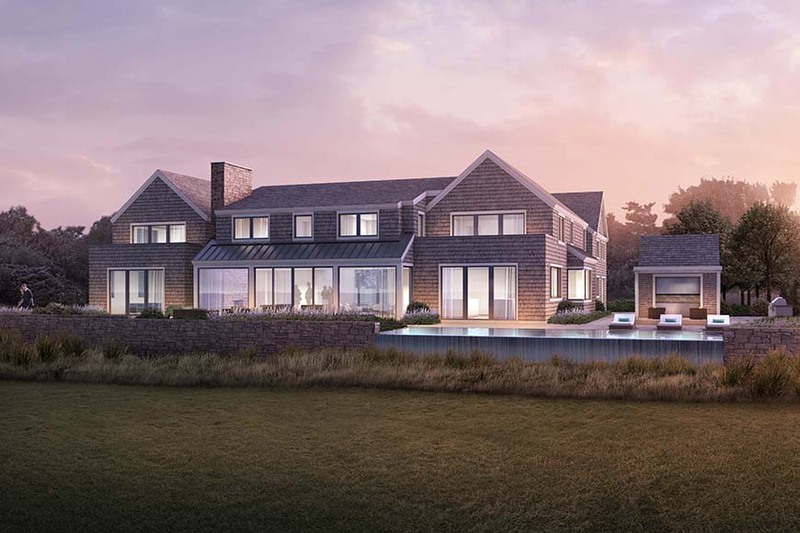 This custom built ground up home respects the vernacular of eastern Long Island while creating an open floor plan for modern living. 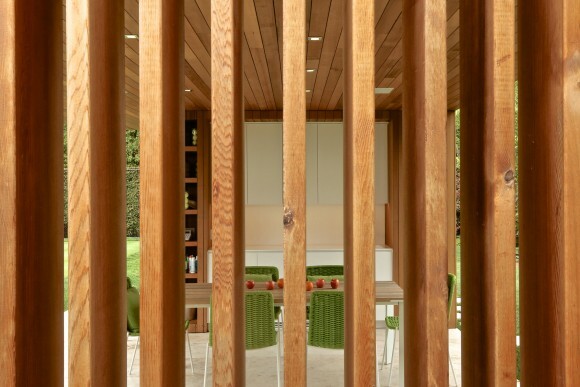 This house was designed for a growing family and weekend guests. 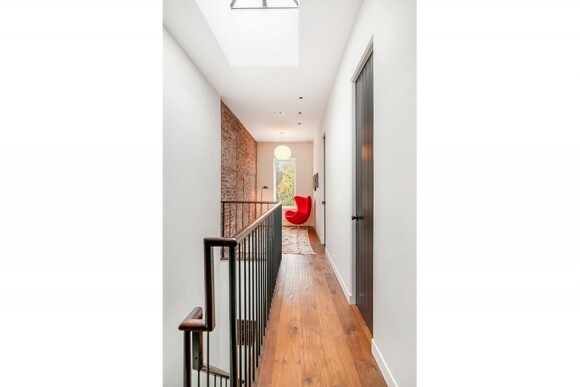 The most notable feature is a 2-story Living space with exposed beams and open staircase to the bedrooms. 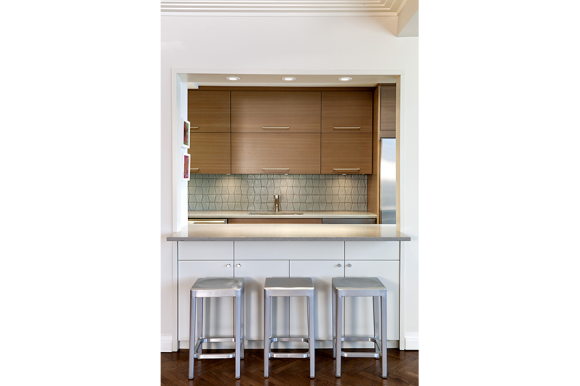 The kitchen features 2 islands and custom cabinetry and finishes as well as an adjacent family room for this young family. 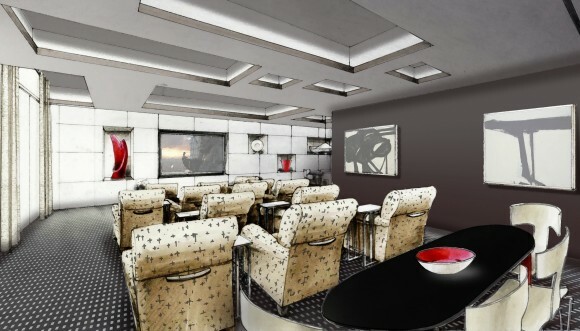 This 6000 SF apartment is being fitted out to suite the needs of the client. 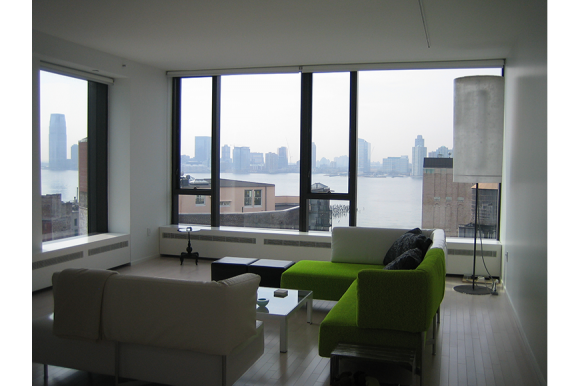 The apartment offers un-obstructed Hudson River views, providing a backdrop to the architecture that is unmatched. 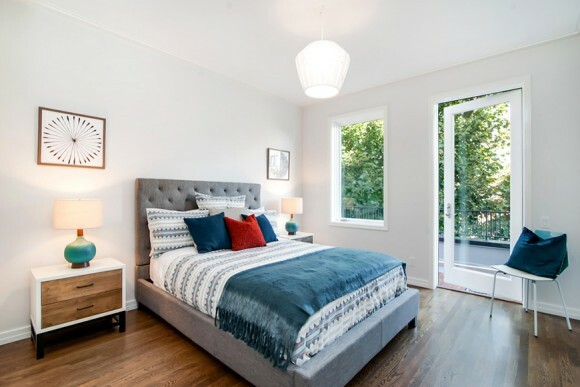 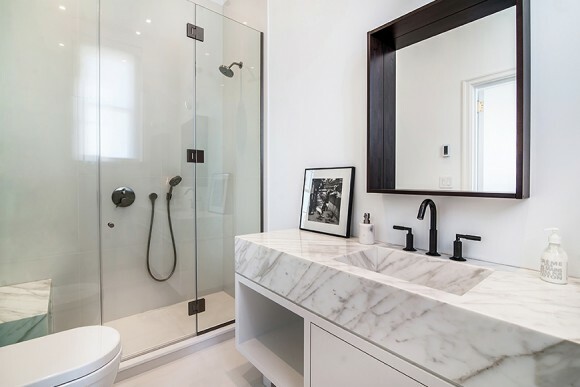 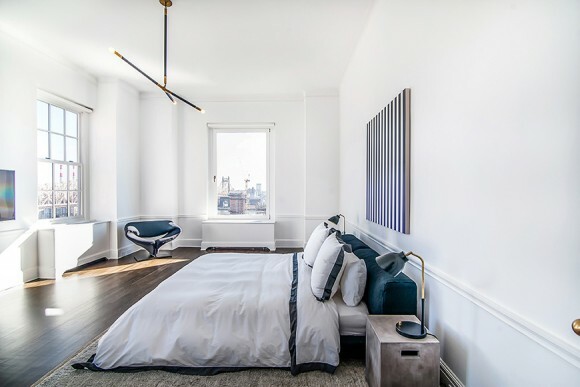 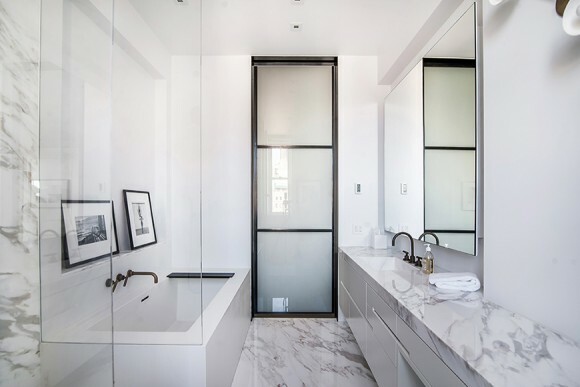 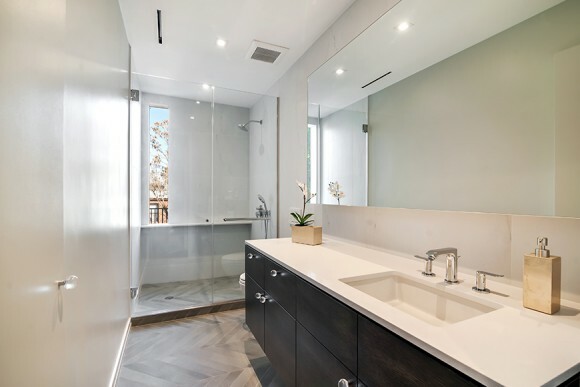 The scope of work includes integral lighting strategies, closets and built-ins, bathroom renovations and custom finishes to turn this developer property into a one of a kind apartment. 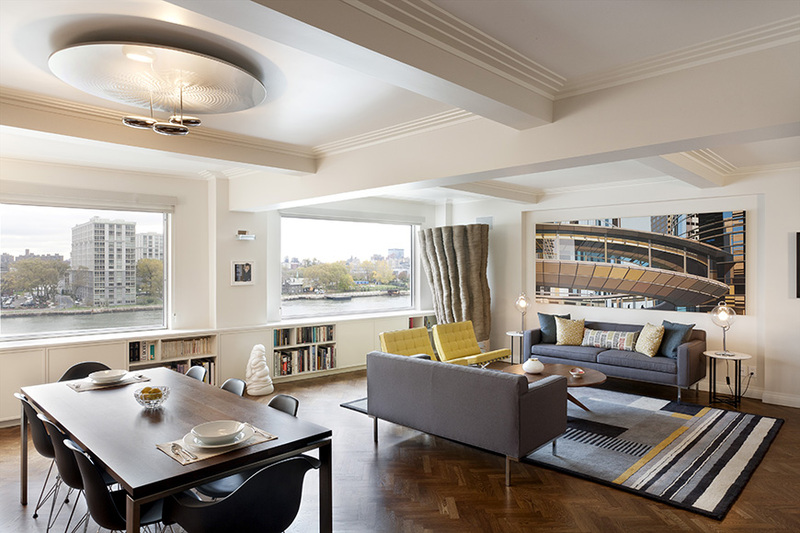 This design/build project resulted in a complete transformation of a 3,000 SF apartment with sweeping views of the East river. 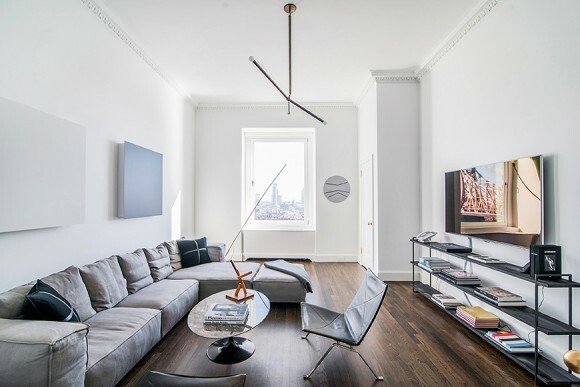 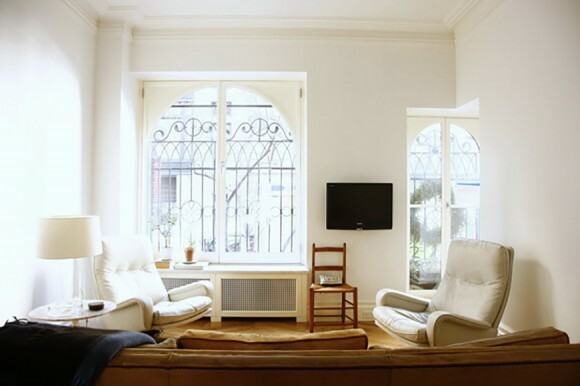 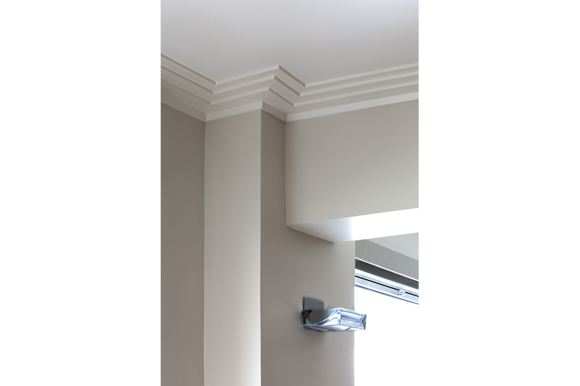 This significant transformation was manifested in the materials, lighting and architectural details throughout the apartment. 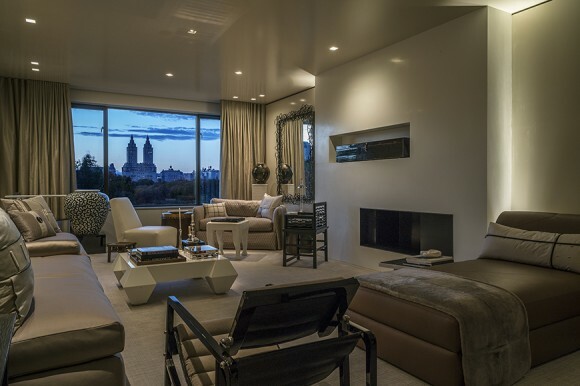 The clients’ unique art collection and east end views were the inspiration for the design. 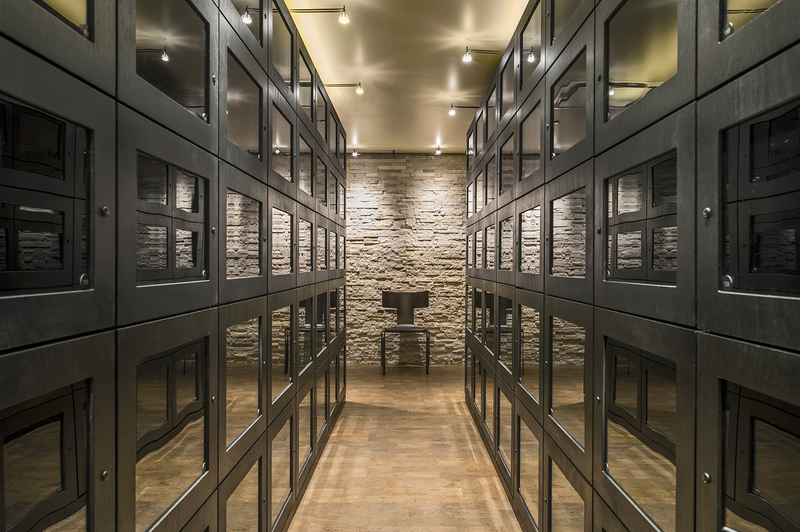 This wine cellar serves the needs of 200 residences by providing each with their own wine locker. 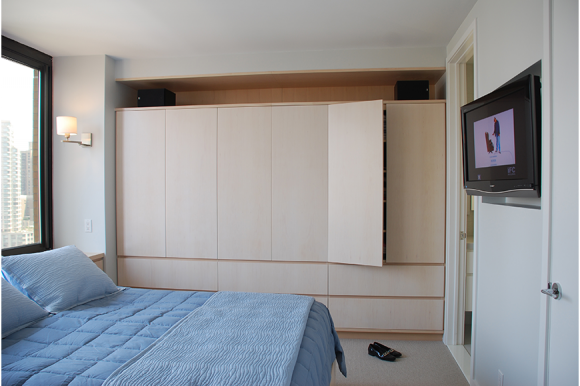 The room is functional while creating an environment for relaxation and enjoyment. 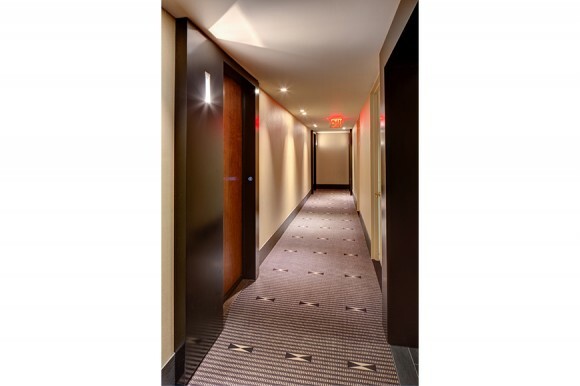 Green materials are incorporated including cork flooring and LED lighting and state of the art cooling system. 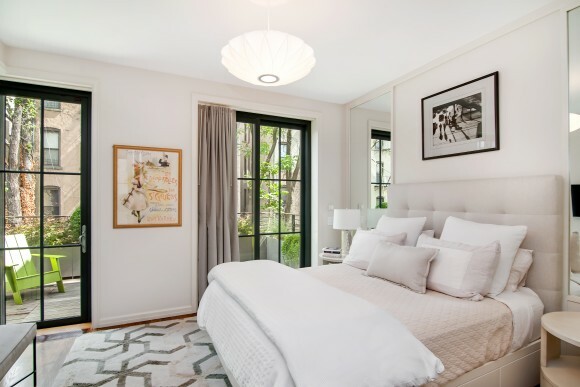 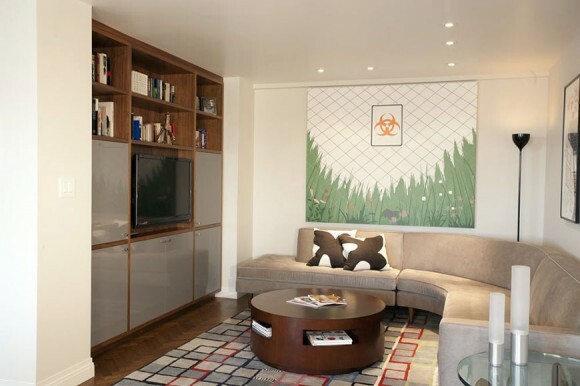 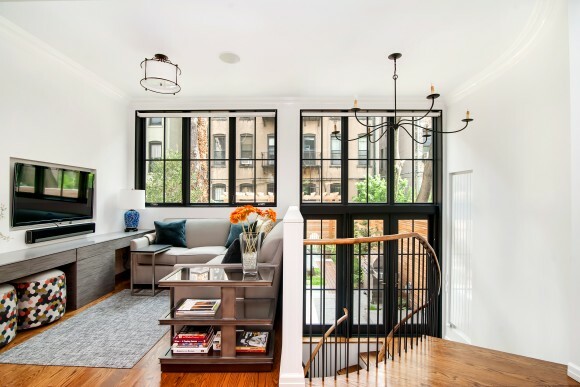 This project designed by its owner/architect and built by Harper Design Build resulted in the quintessential Gramercy garden apartment. 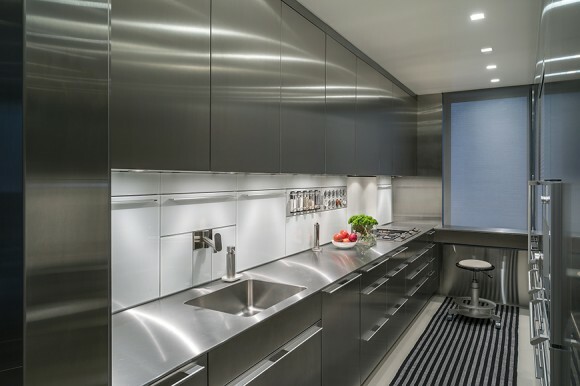 Custom detailing throughout includes herringbone floors, back-painted glass panels and a custom stainless steel kitchen. 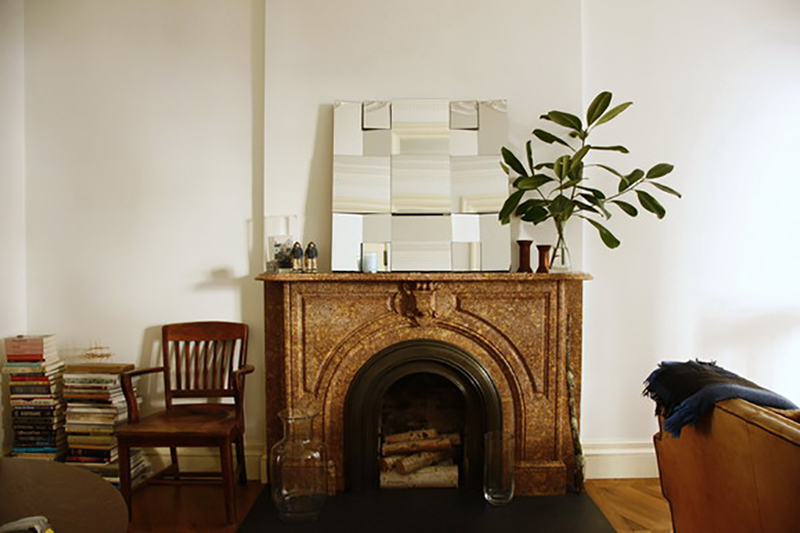 To update this classically detailed Brooklyn apartment we had to be respectful of the past while creating a space for modern living. 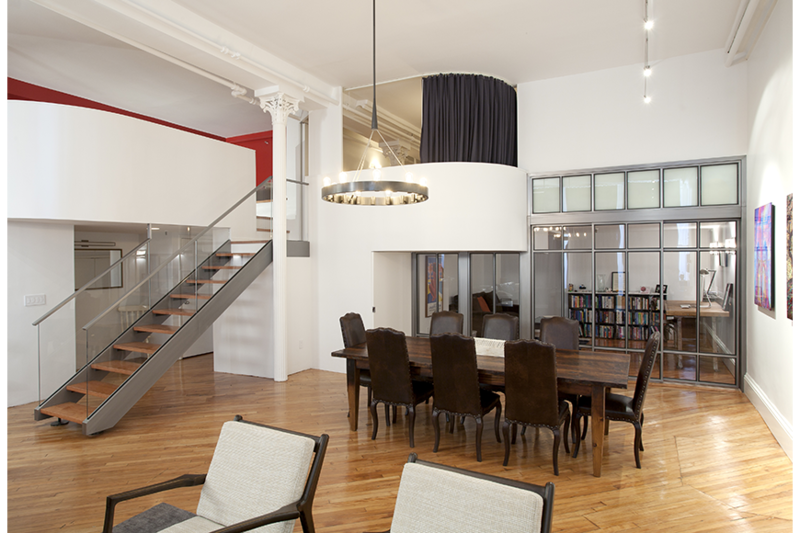 The result of this design/build project was a marriage between old and new. 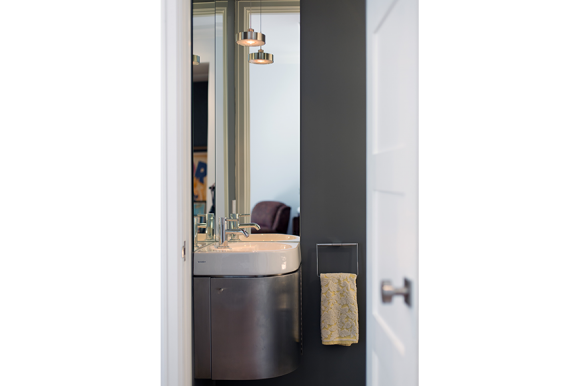 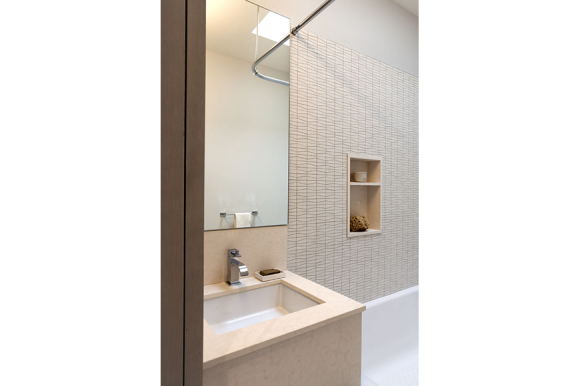 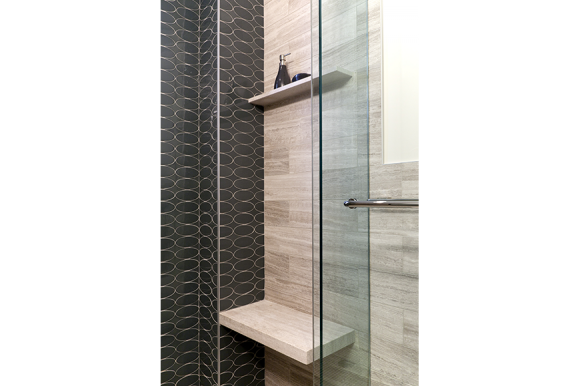 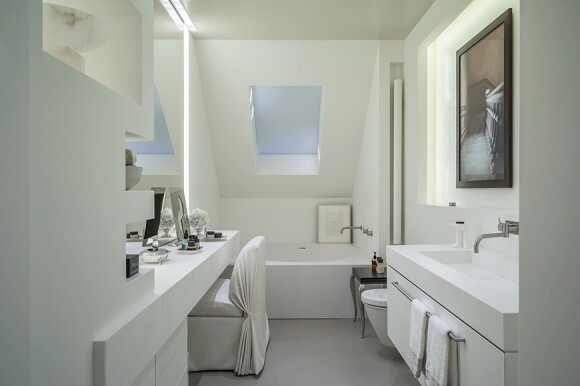 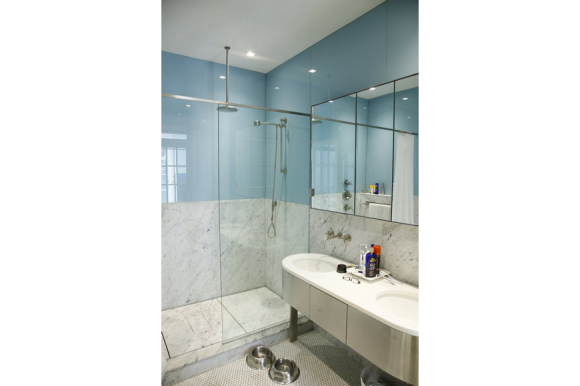 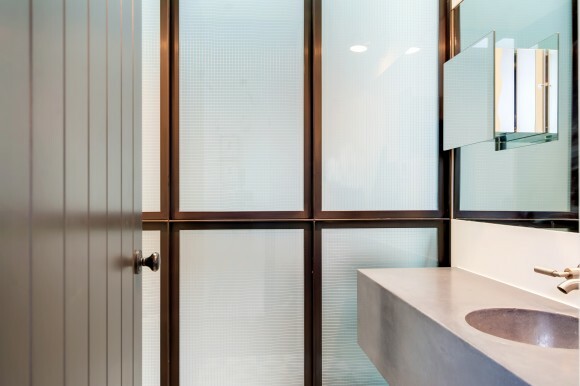 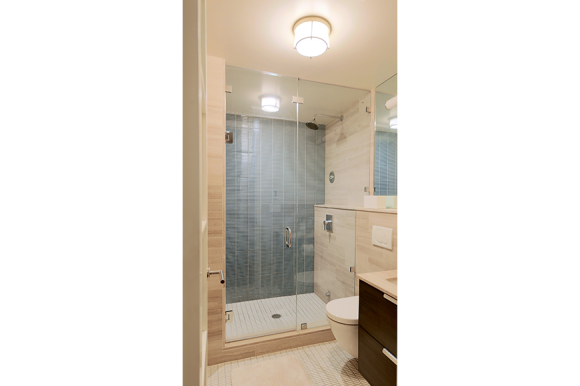 The small master bathroom was made to feel open by using light materials and a custom shower curtain as an architectural feature. 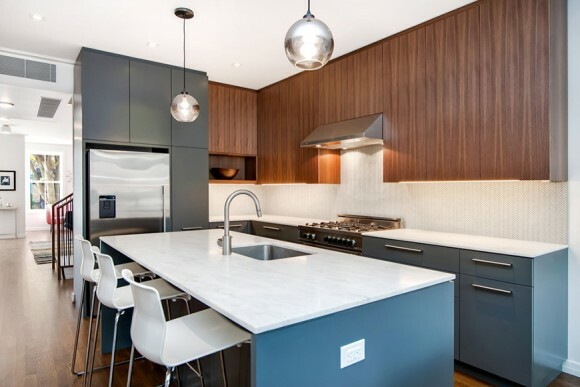 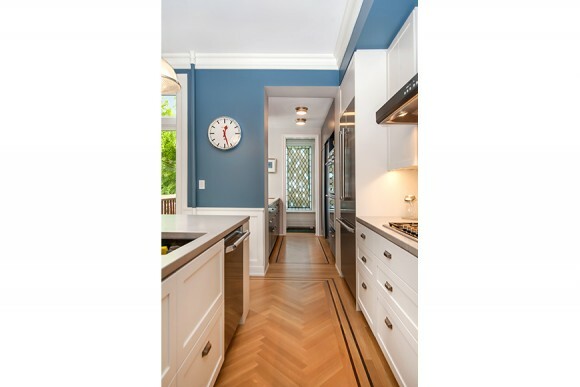 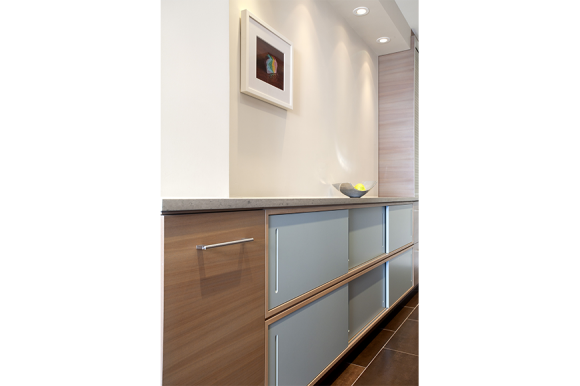 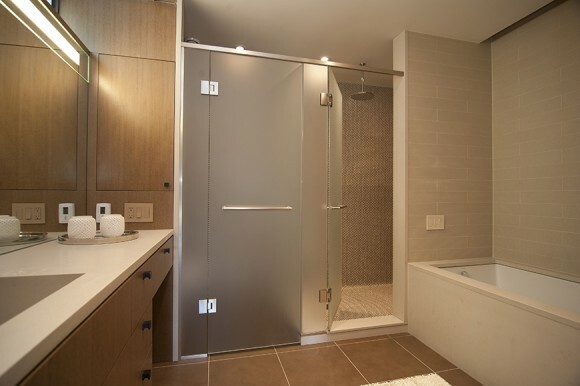 This gut-renovation build project incorporates clean lines and custom built cabinetry throughout. 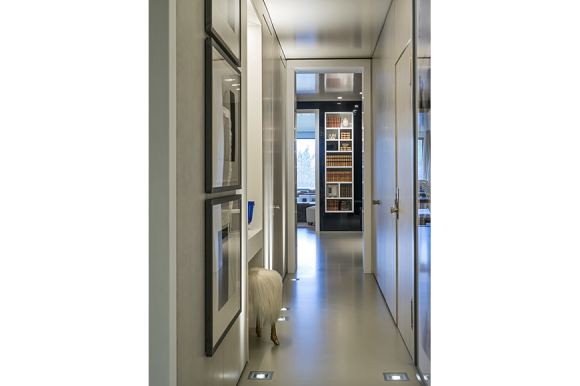 The scope of work includes the use of special finishes like 3-Form sliding doors, corian countertops and a Boffi kitchen. 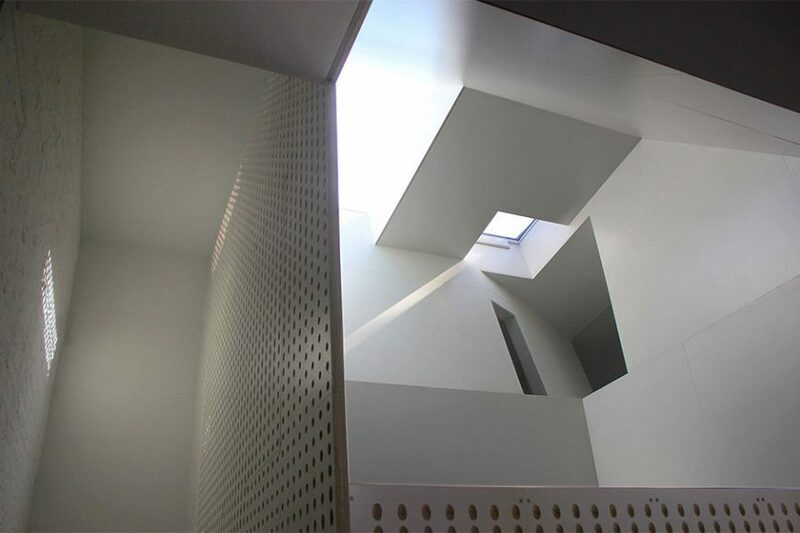 This build project added architectural detail where none existed. 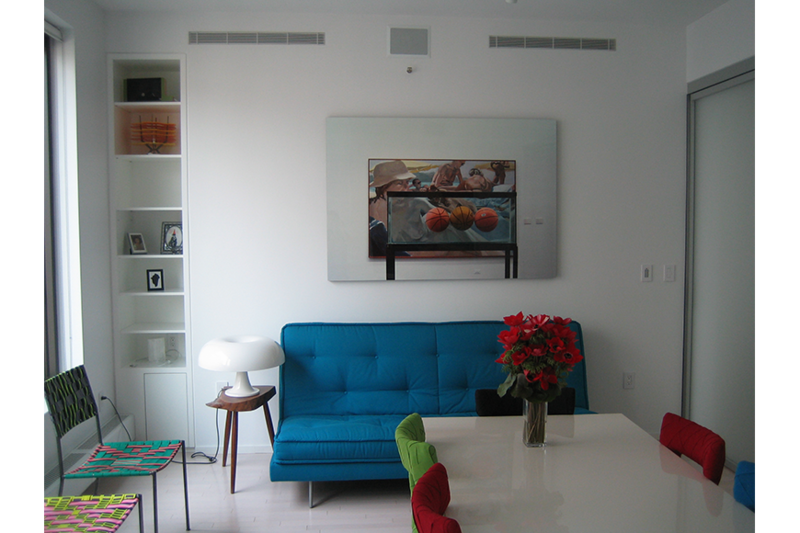 Aluminum and glass doors, Barisol Ceiling lighting and venetian plaster walls gave this apartment an updated look suitable for its owner. 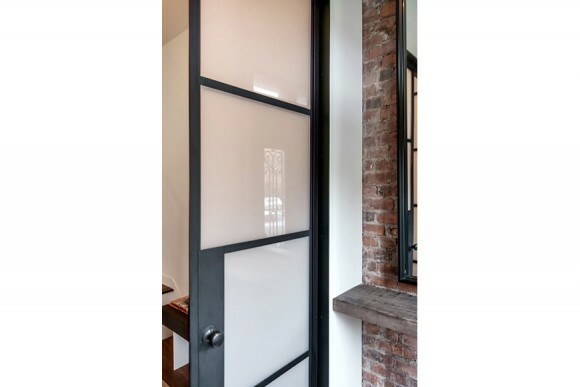 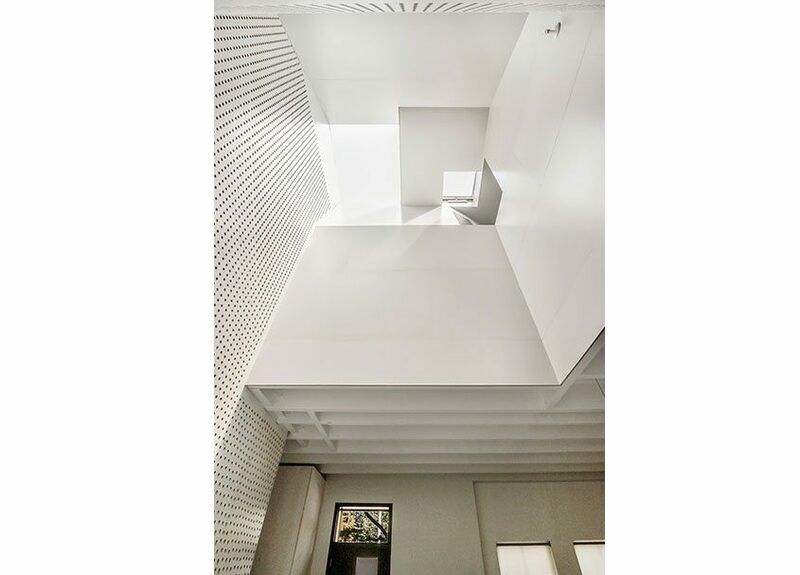 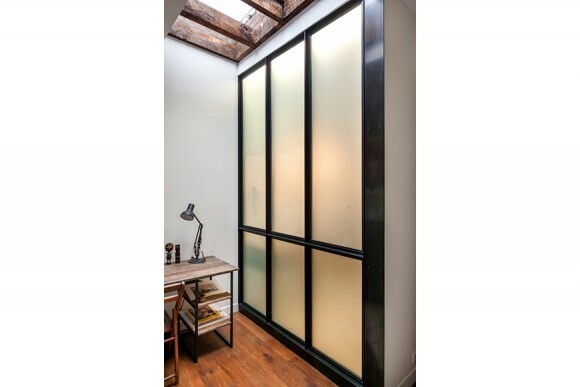 Design/build additions to this apartment include steel and glass doors to separate office and living space, a new staircase leading to a sleeping loft and new lighting bring this loft to life. 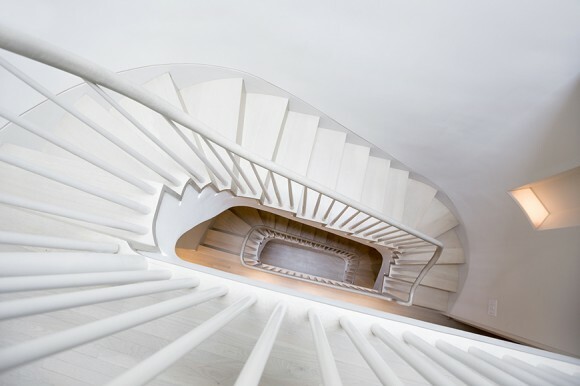 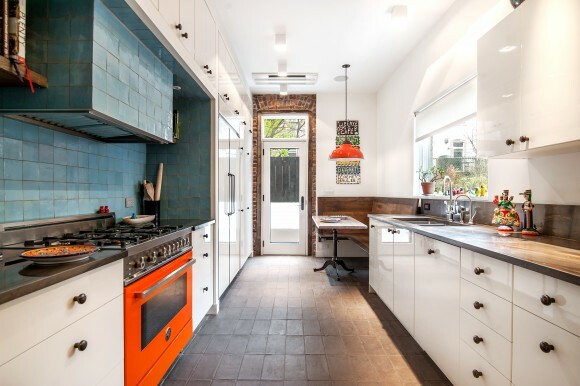 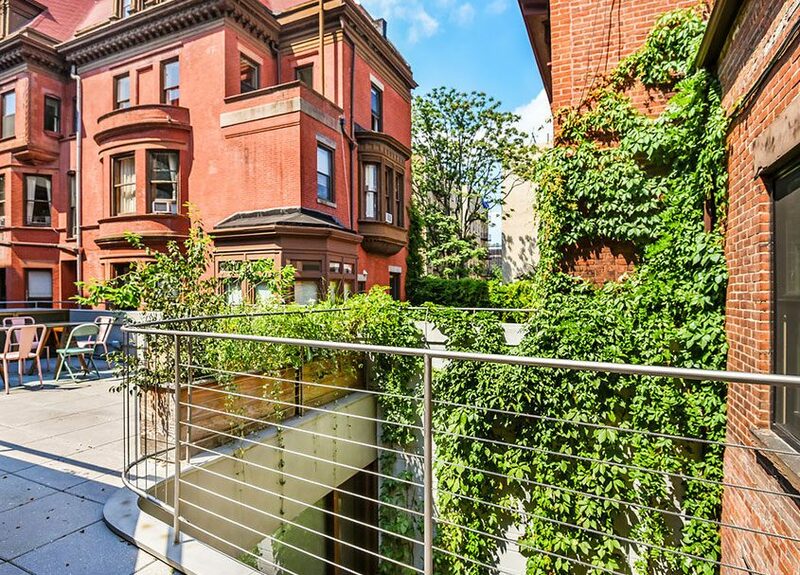 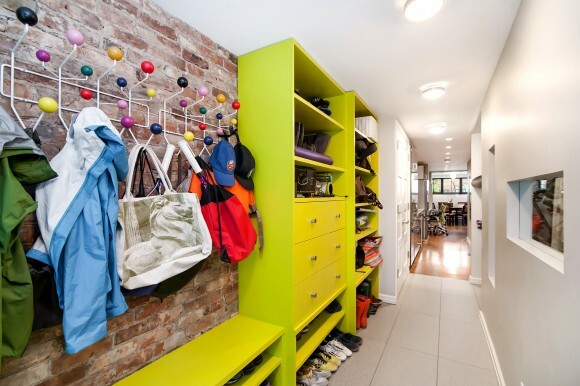 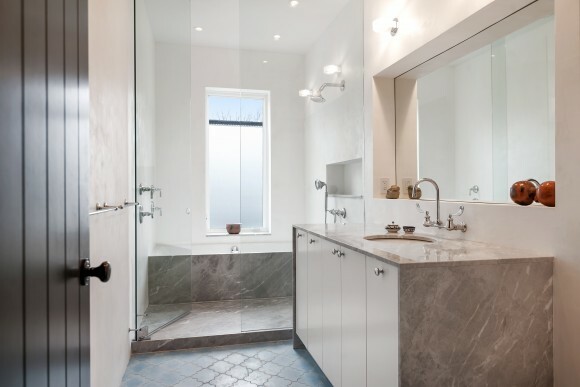 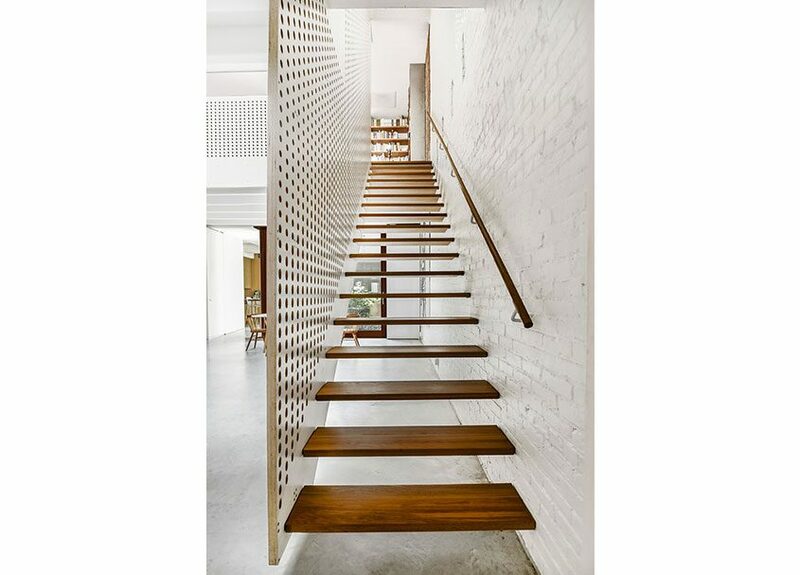 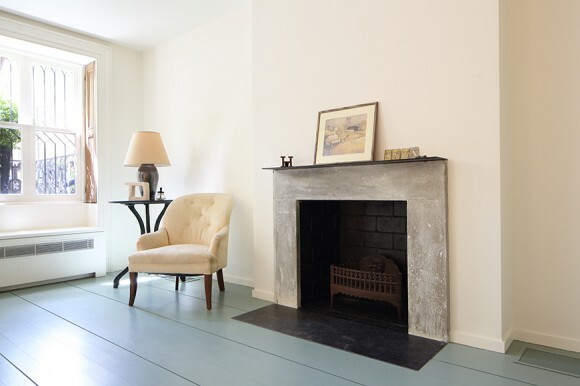 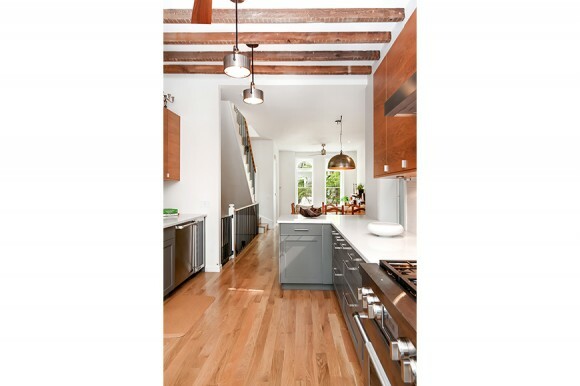 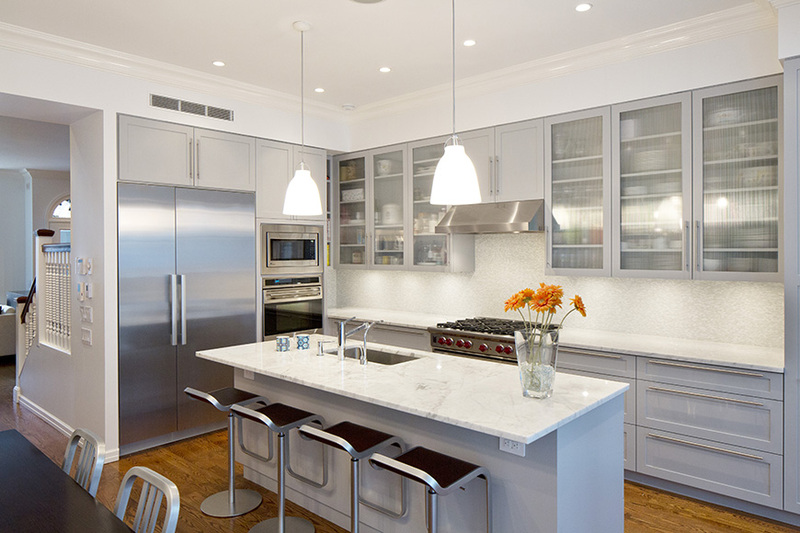 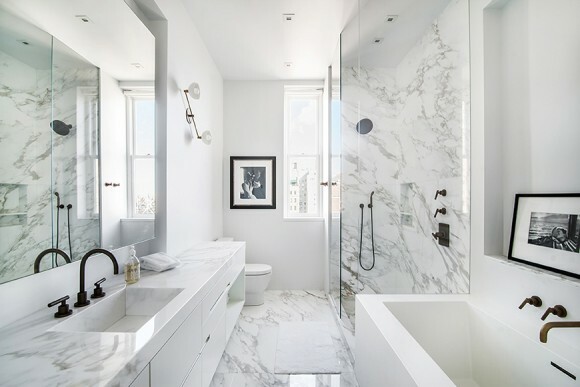 This design/build, gut renovation of a Brooklyn townhouse resulted in 3,600 SF of living space. 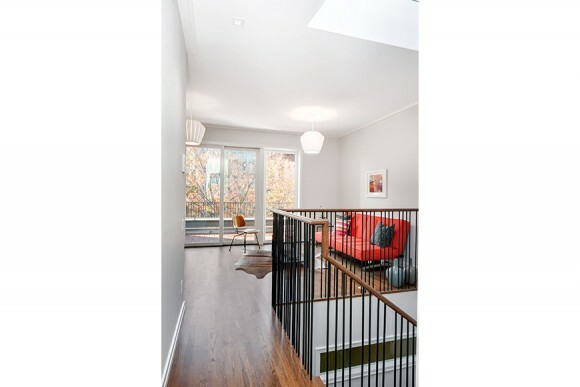 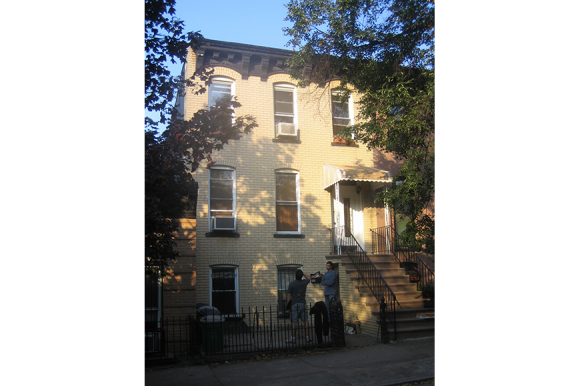 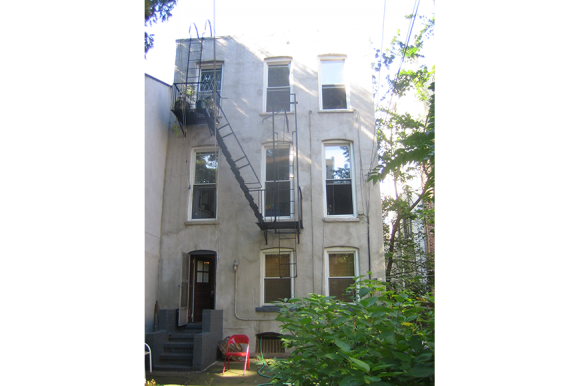 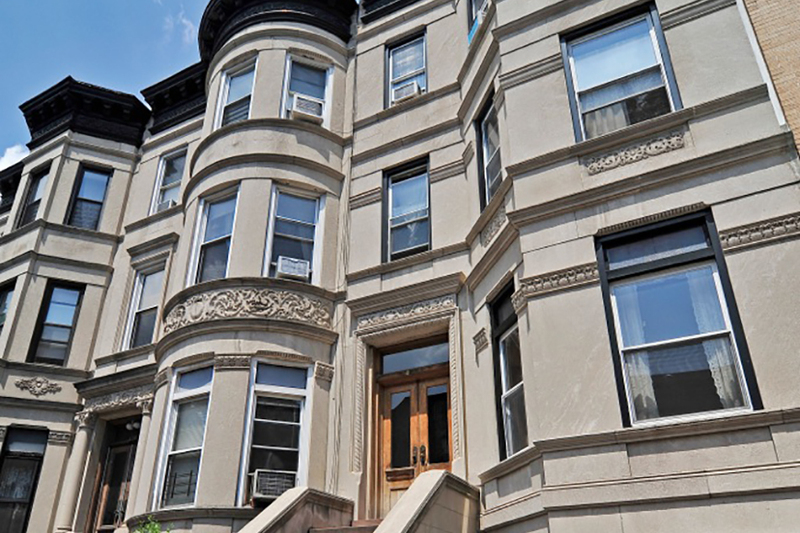 A 3rd floor addition created 5 floors of living space, allowing for an owners triplex and rental duplex. 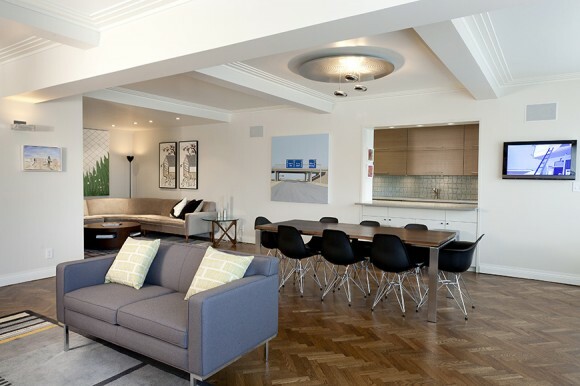 The parlor level is an example of true, modern living evident in the open floor kitchen and curving wall connecting the living spaces. 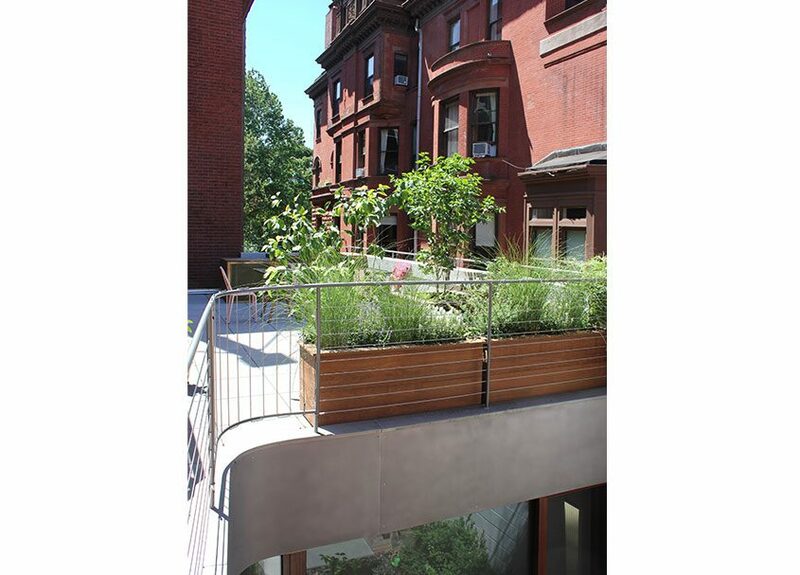 The front and rear facades of this house were completely transformed. 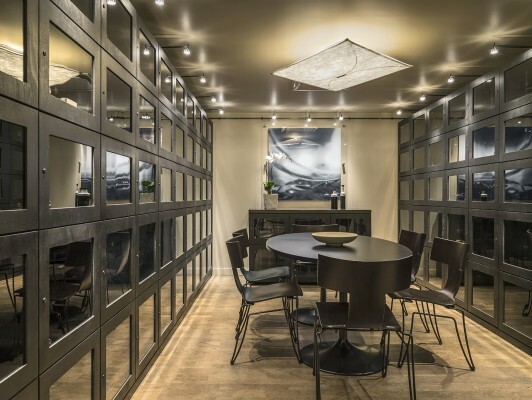 The goal for this renovation was to create a store that could be interchangeable and seasonal, but still retain the connection to the flagship store in Manhattan. 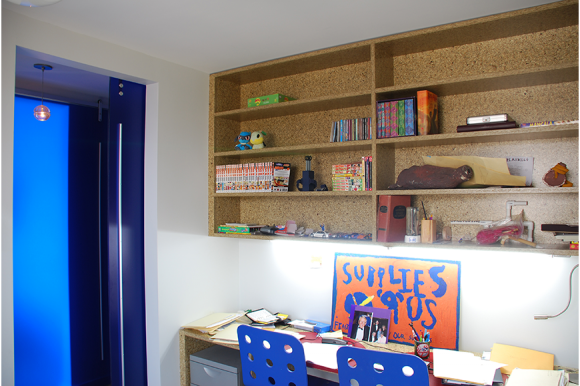 The rear wall was designed to be a feature of the store and will change over time. 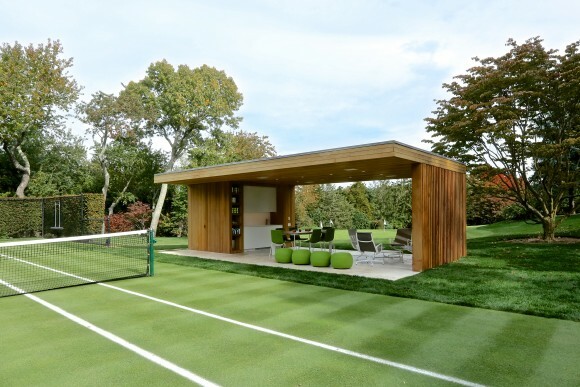 A casual feel reminds you are in the Hamptons. 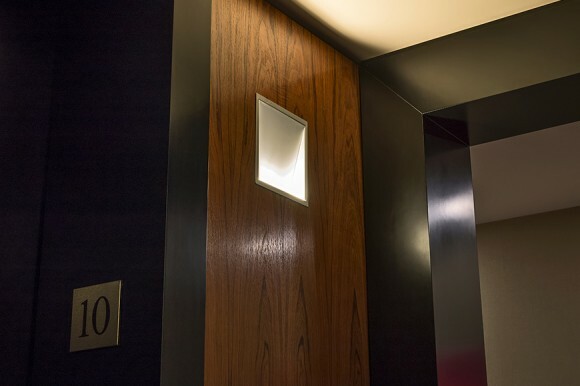 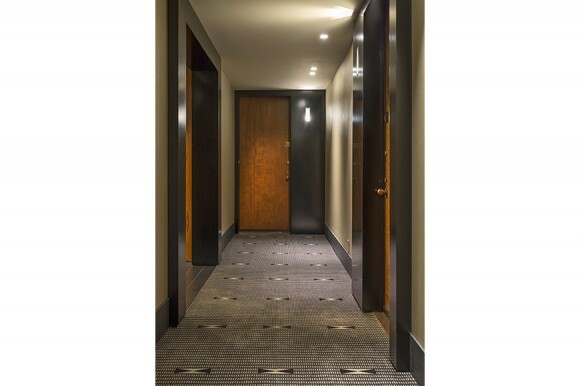 This renovation of 42 floors of public hallways includes lighting design, custom millwork and finishes. 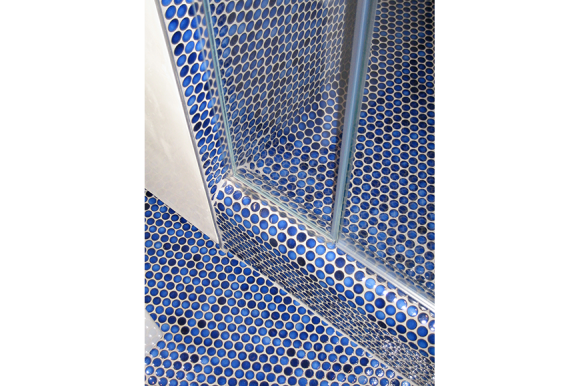 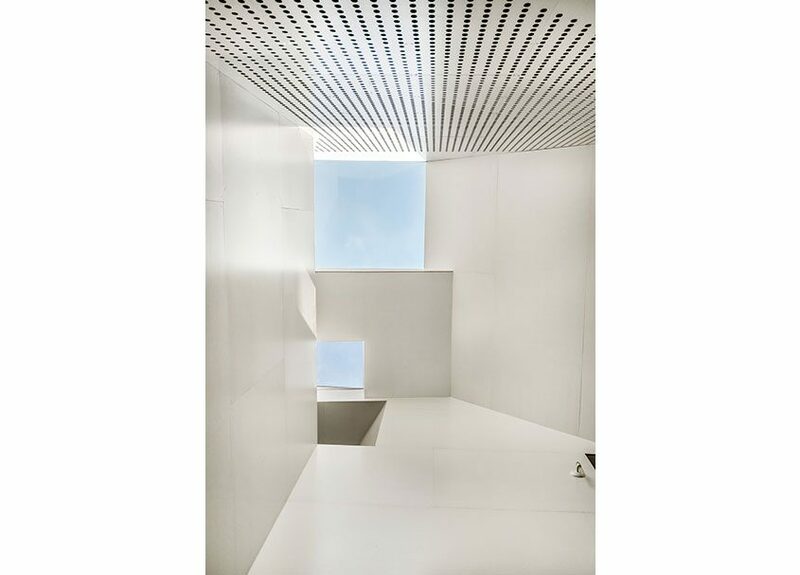 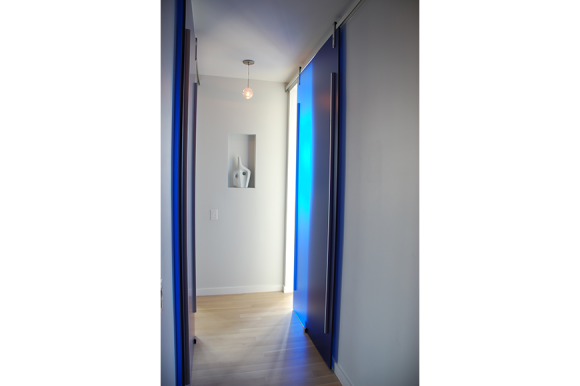 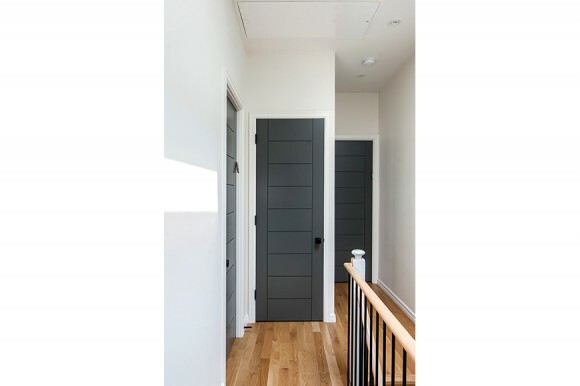 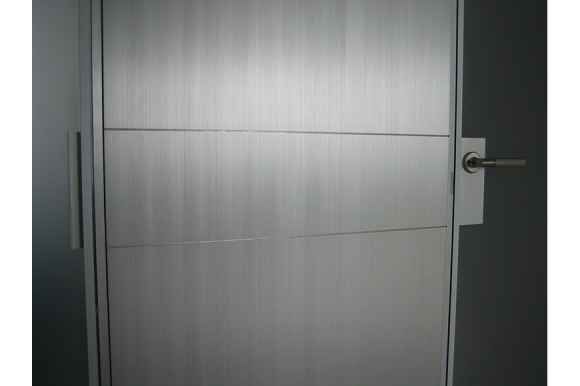 Designed in collaboration with Celeste Cooper, the goal of this project was to create a spatial progression from the elevator door to the front door. 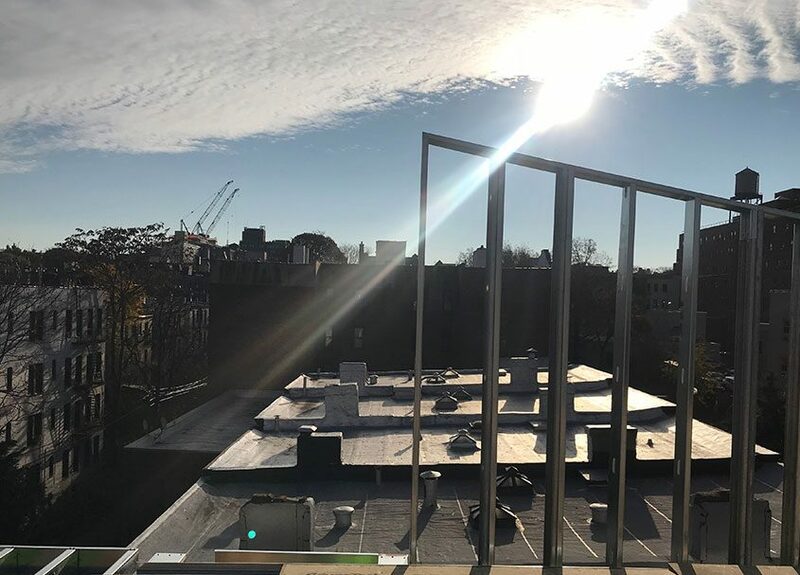 This design/build project is currently under construction and slated to complete in late 2019. 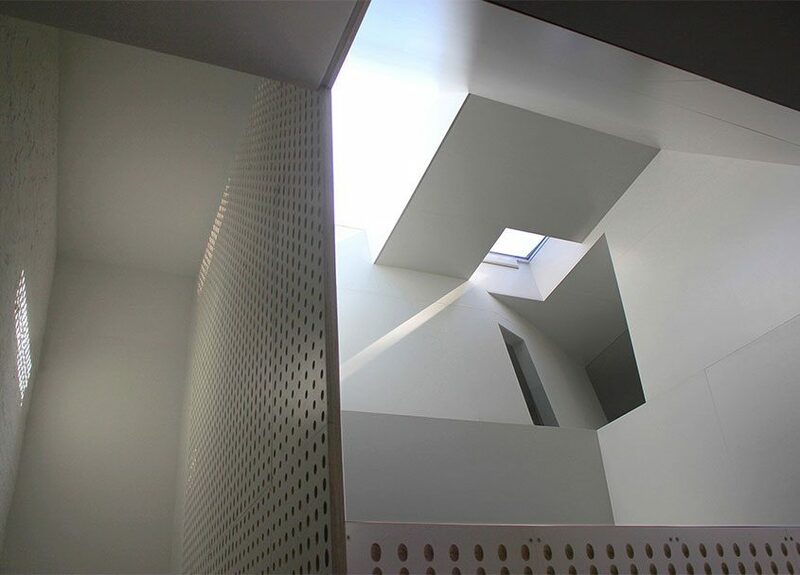 The unique features of this project such as a driveway, garage, 85’ long lower floors with 13’ ceilings make this a one of a kind structure. 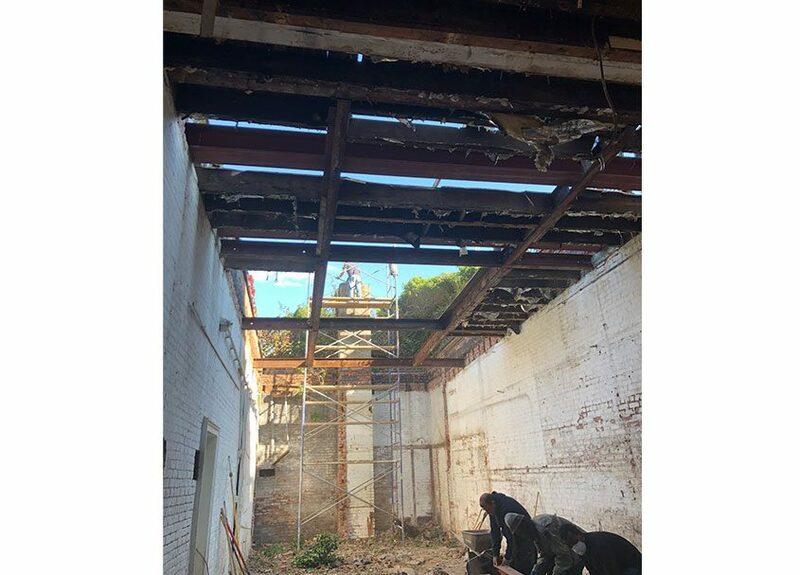 The design will capitalize on these features by adding 9 skylights, large window openings, and new polished heated concrete floors. 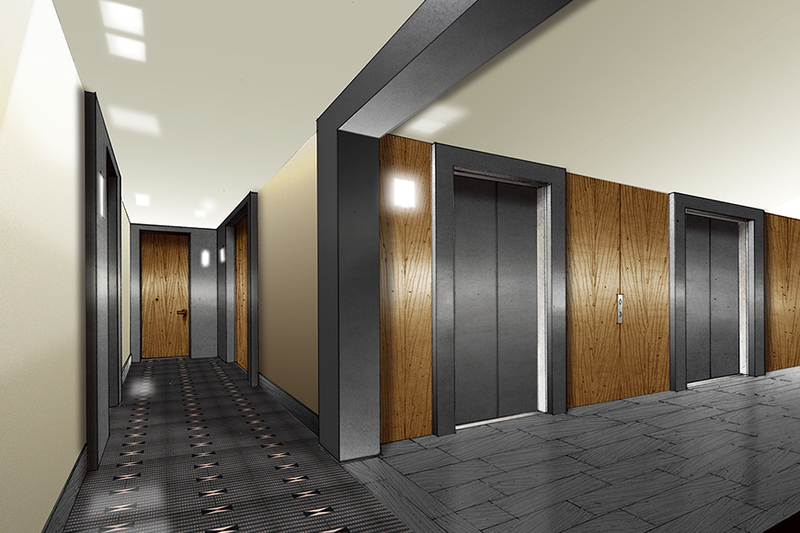 The final product will be a modern 5000 sf building with new facades and state of the art infrastructure. 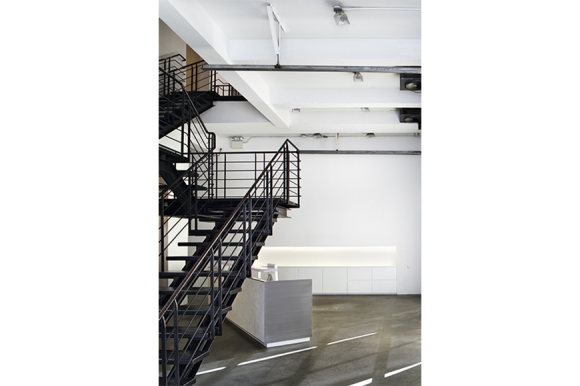 The renovation of this gallery has been an evolving and ongoing progress since 2006. 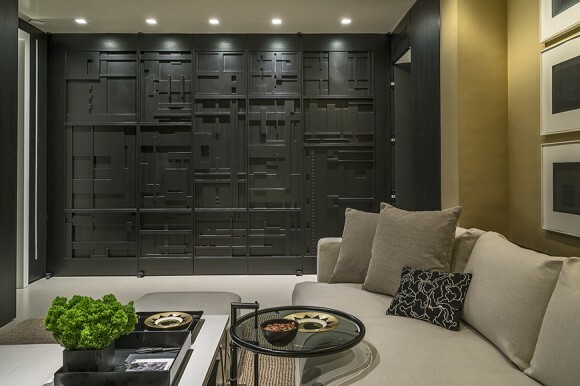 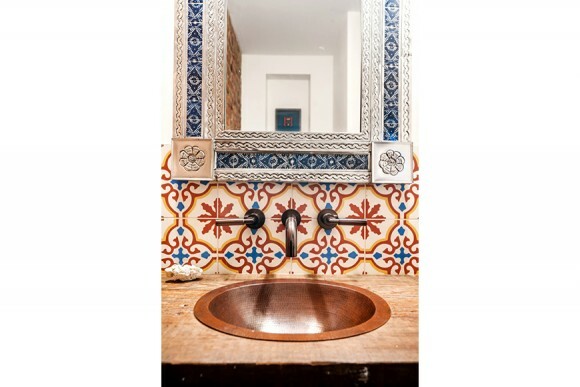 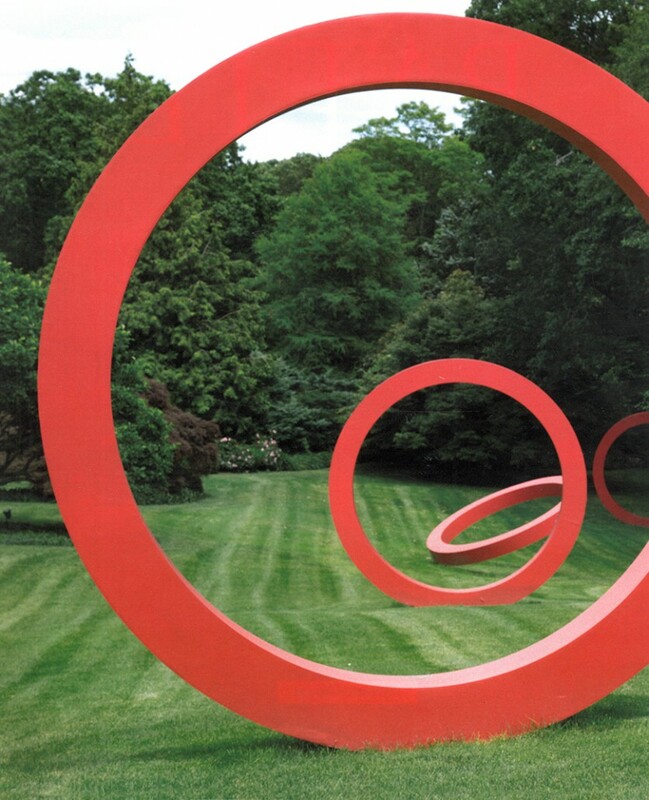 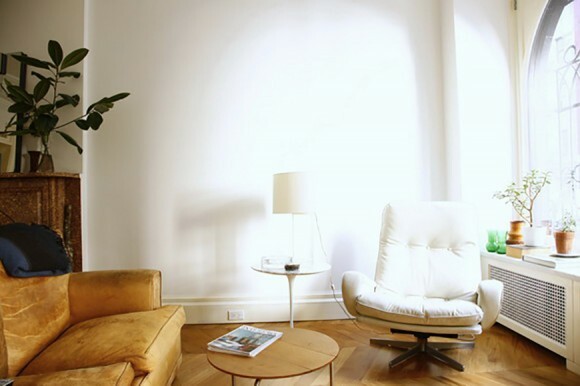 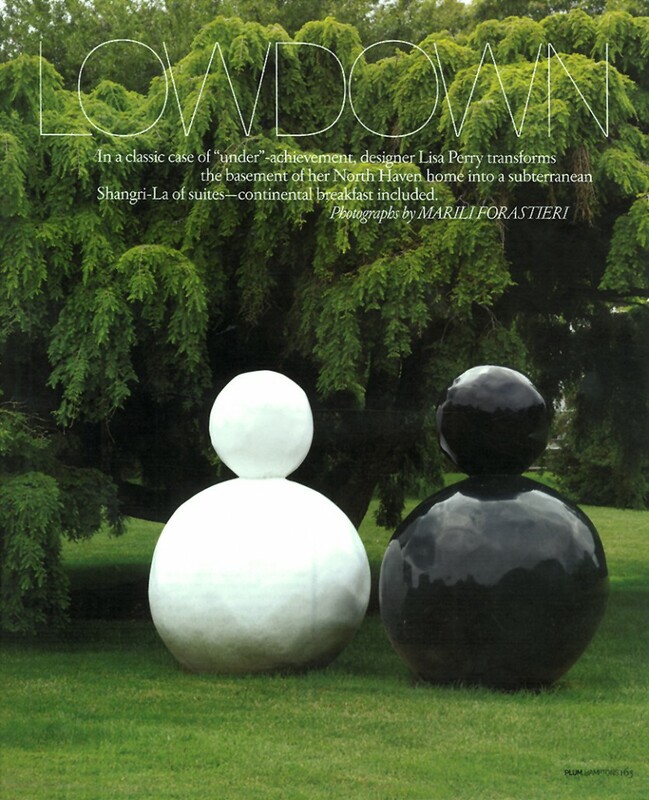 The spaces and details are minimal in style to focus attention on the art. 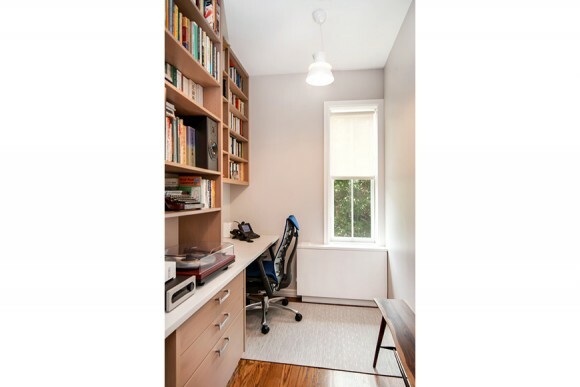 Scope of work includes office space, art storage, custom desks and millwork, and floor finishes. 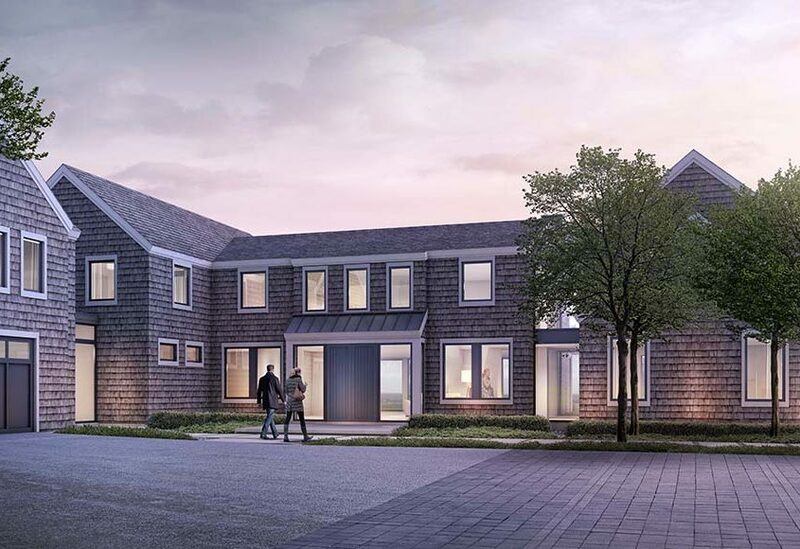 This 4,000 SF design/build project will have everything a family of 5 could desire. 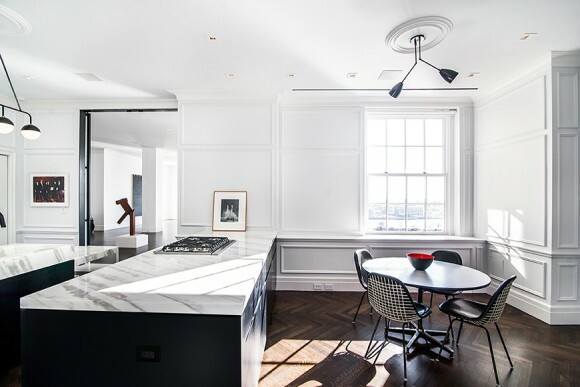 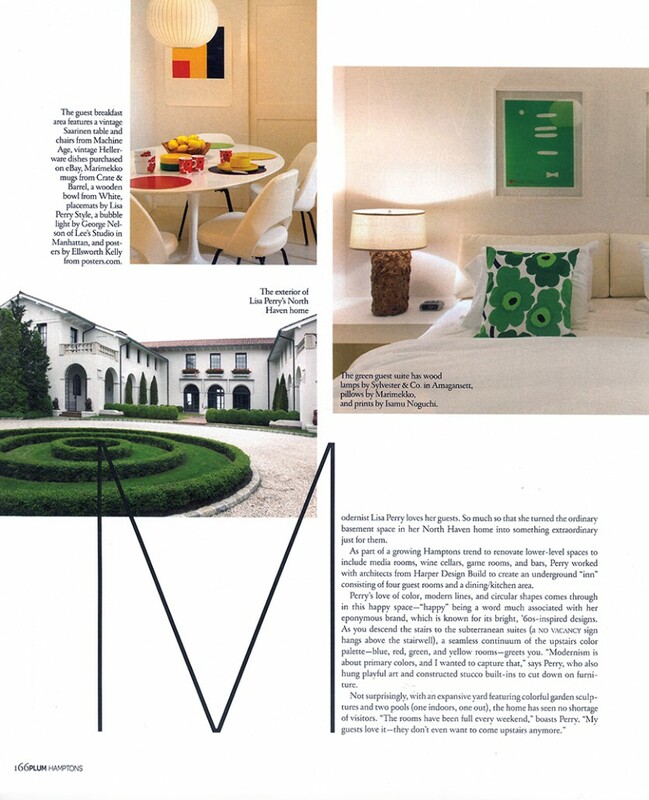 Modern living on the interior juxtaposes the historic exterior limestone facade built at the turn of the century. 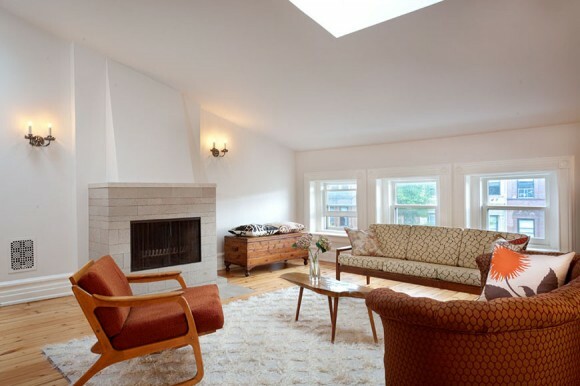 This house has 5 bedrooms, family room, art room, playspace and an open dining/living space on the parlor. Planned for completion in 2014, the entire project will take 12 months including design and construction. 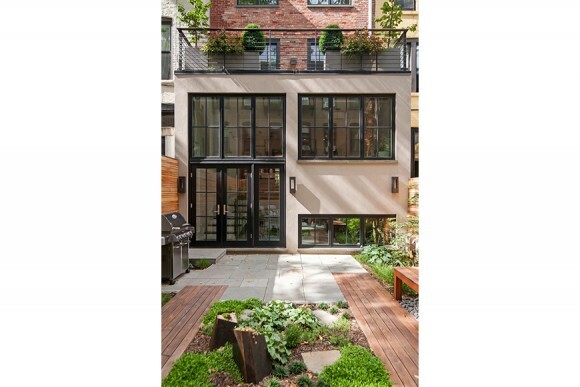 This 5,000 SF design/build project includes a 4 story rear yard addition to a landmark district townhouse. 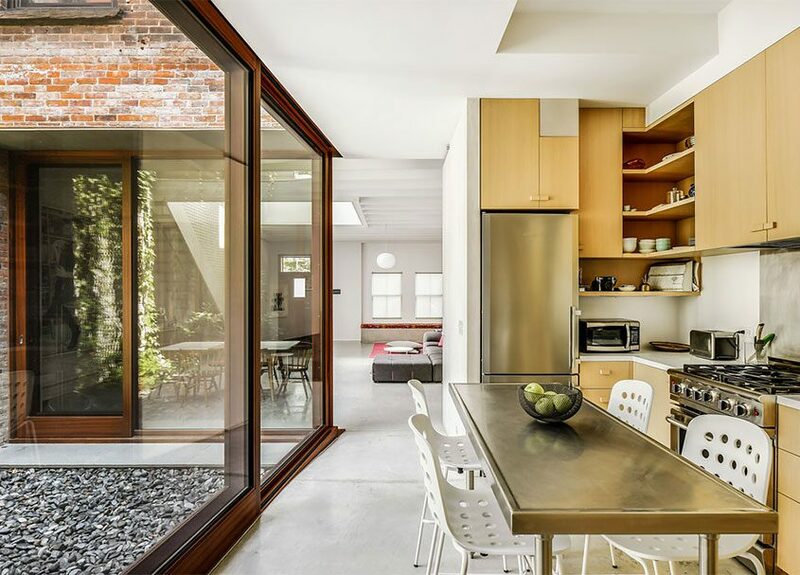 Large, contextual openings grace the rear of this historic home creating a connection between interior and exterior. 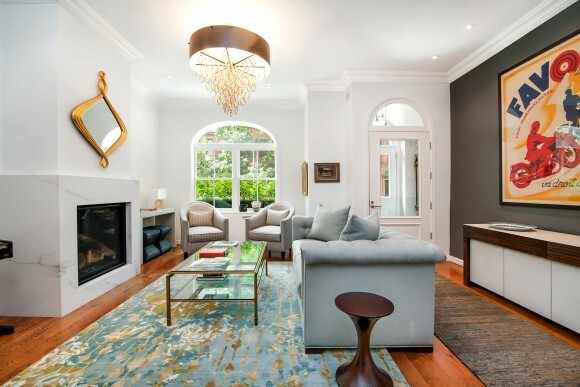 The 55’ deep parlor floor provides plenty of room for entertaining. 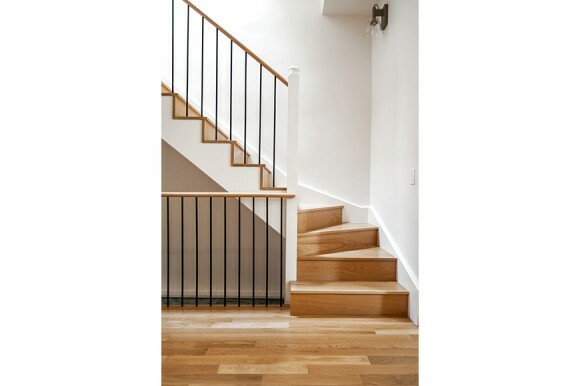 This home also has a full height cellar as a result of underpinning; a family room off the rear garden, 5 bedrooms and 4.5 bathrooms.